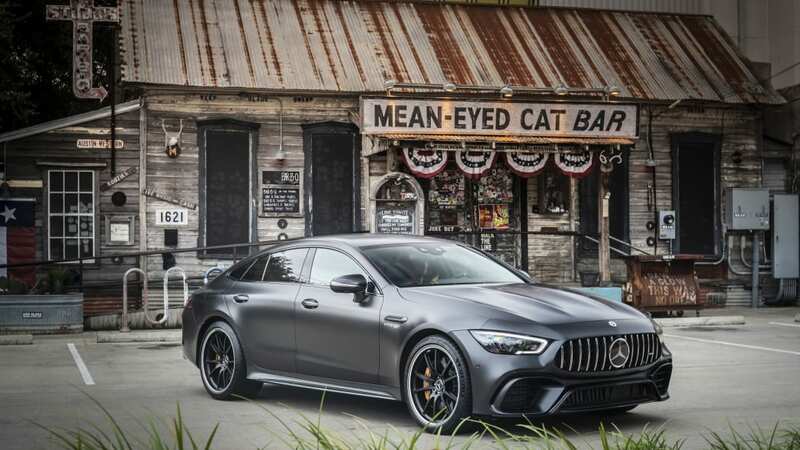 But what about that face? 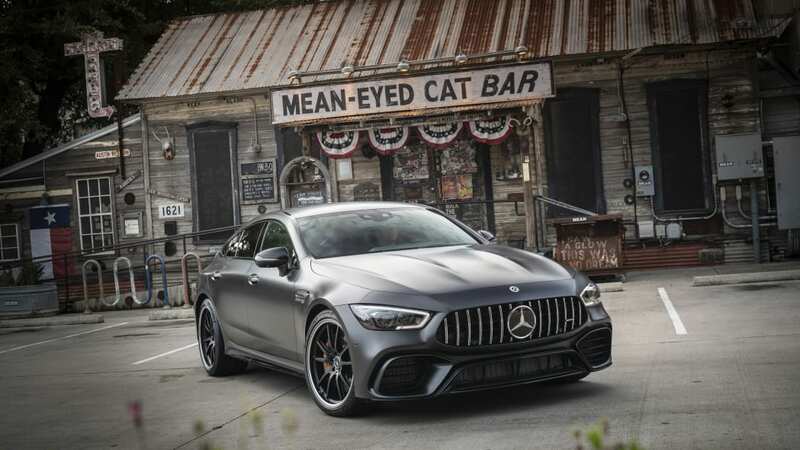 AUSTIN, Texas — Workers in Affalterbach have been stuffing big, stout engines under the hoods of Mercedes-Benz sedans for decades, creating iconic performance cars like the ur-AMG Rote Sau — the "Red Pig," a 300 SEL with a 6.8-liter V8 — or the extremely 1980s AMG Hammer. 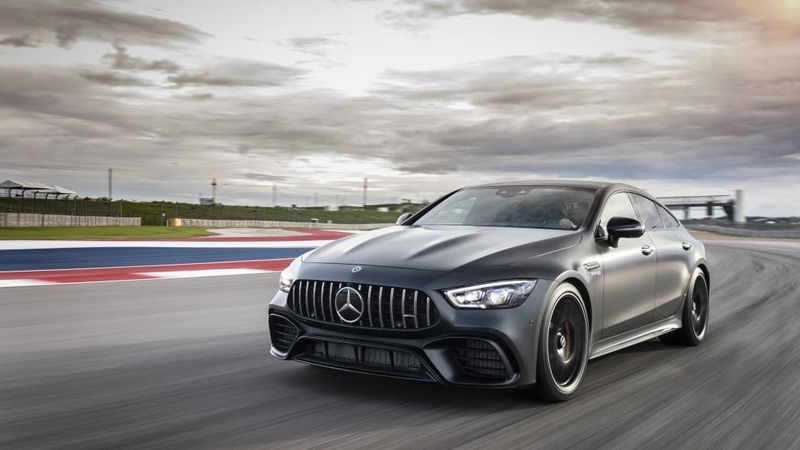 Until recently, most road-going AMGs have been phenomenal straight-line killers that didn't hold up as well as cars from BMW, Audi or Porsche on a track or a winding backroad. 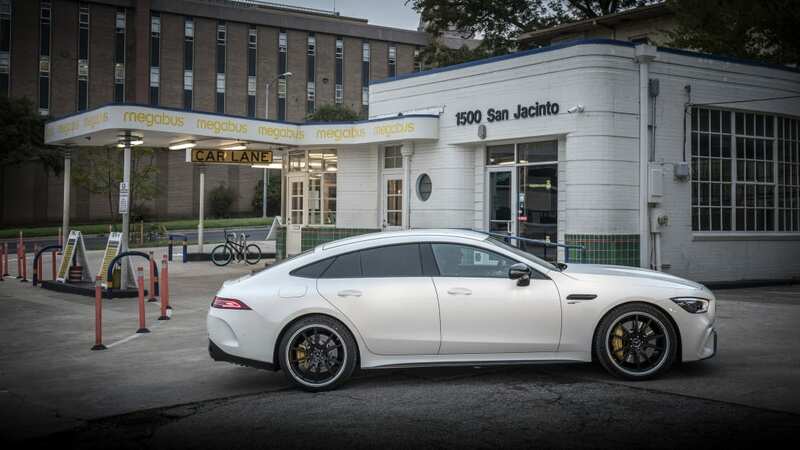 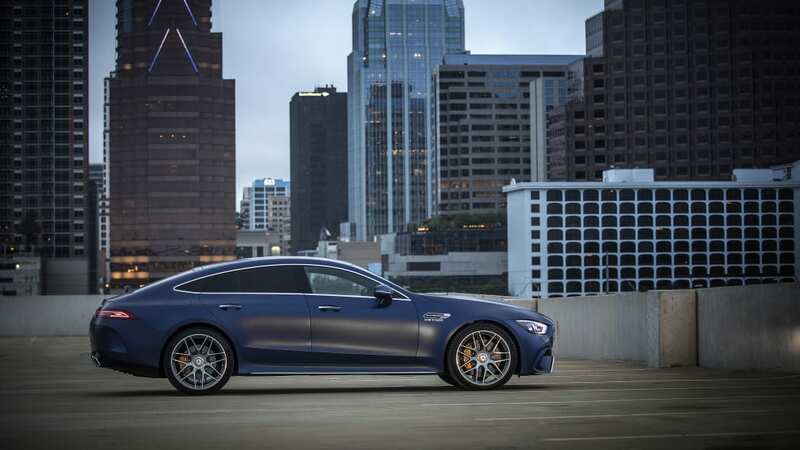 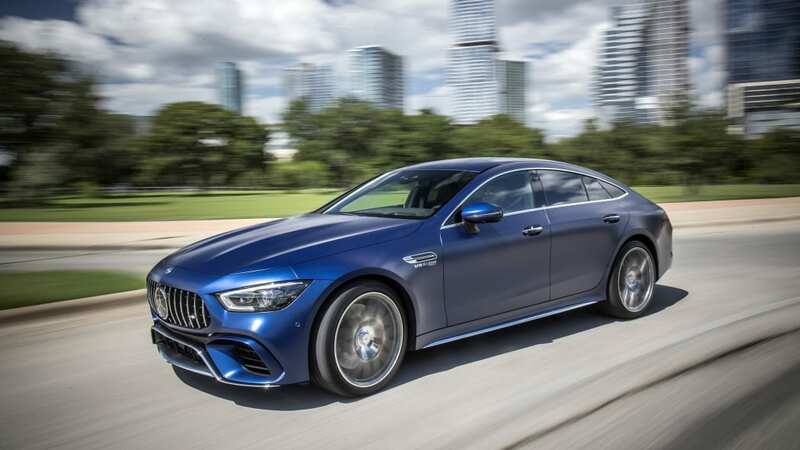 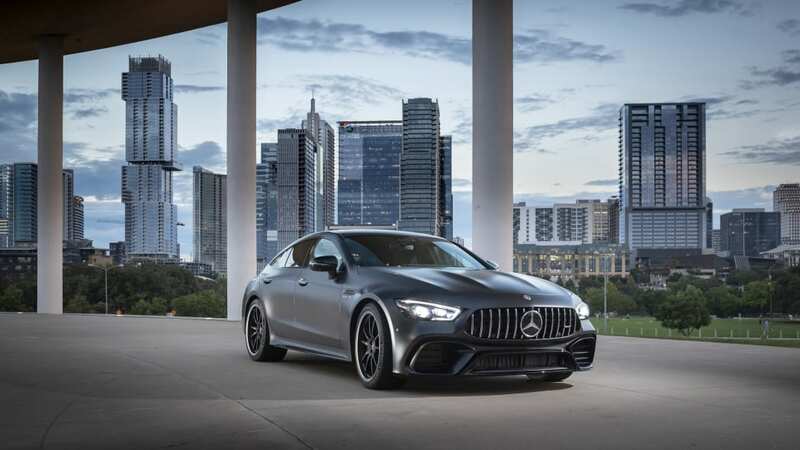 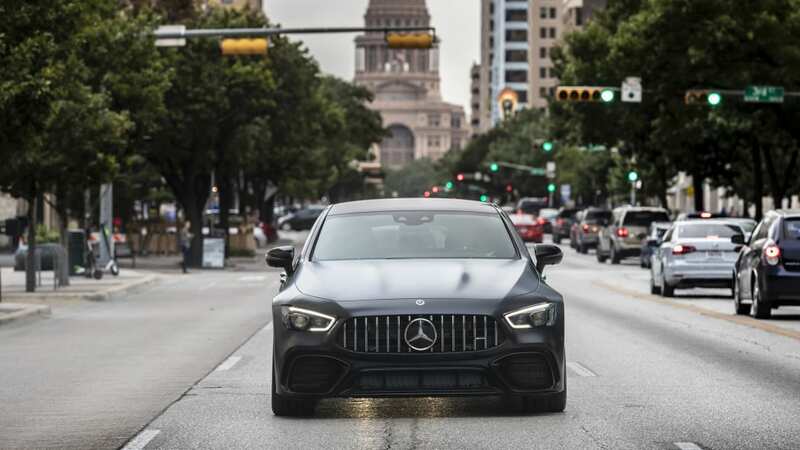 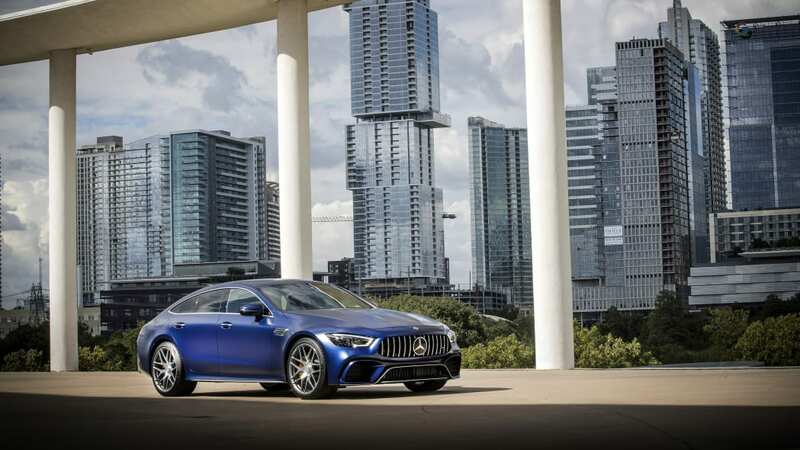 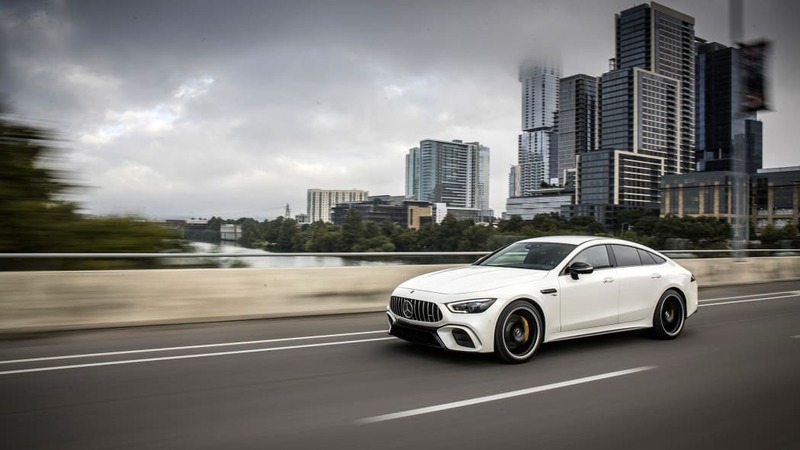 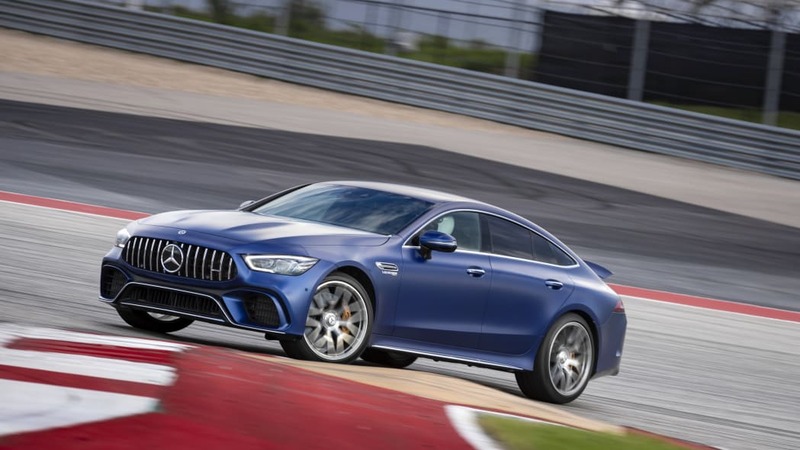 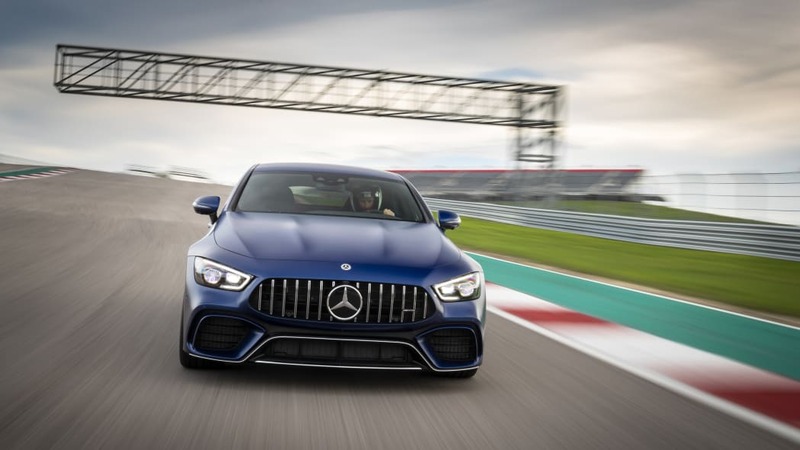 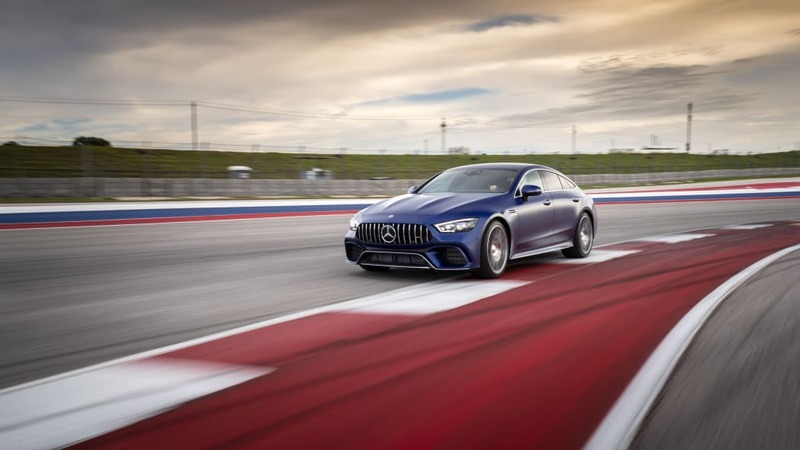 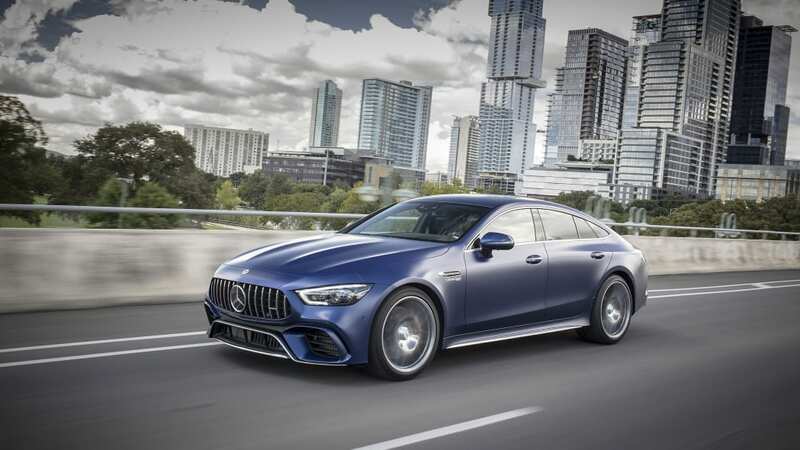 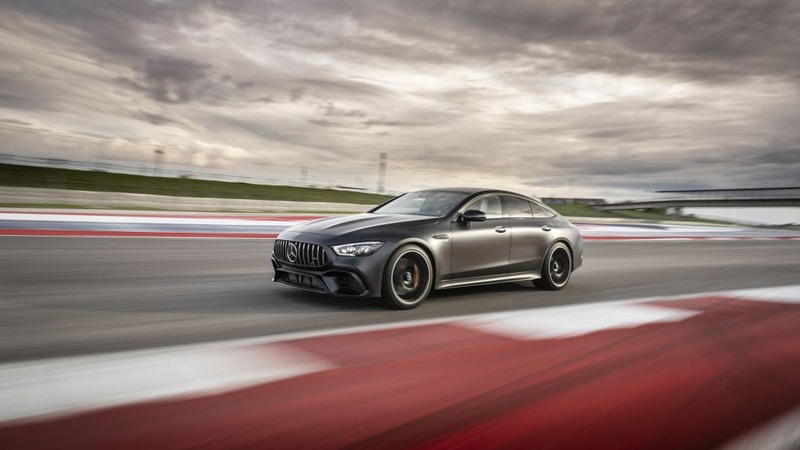 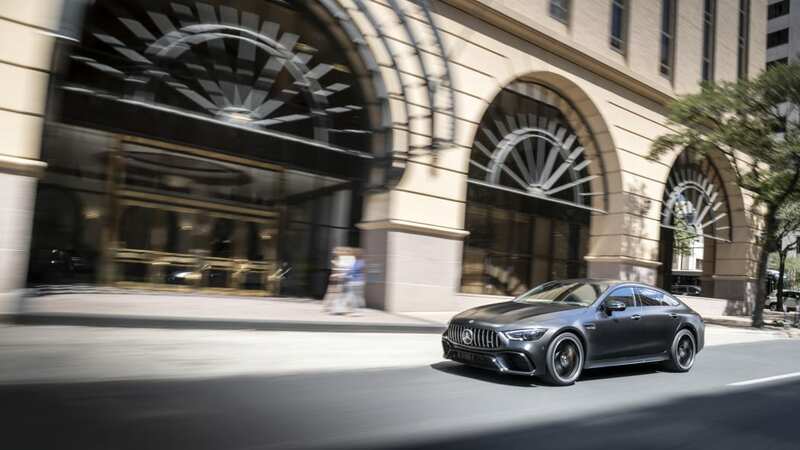 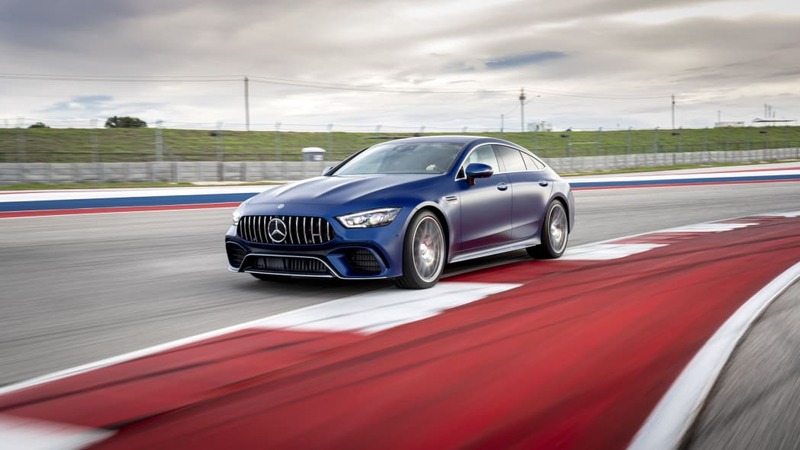 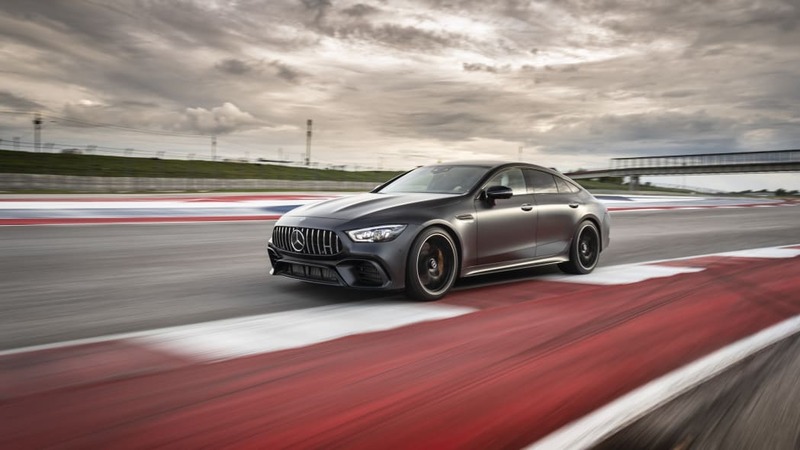 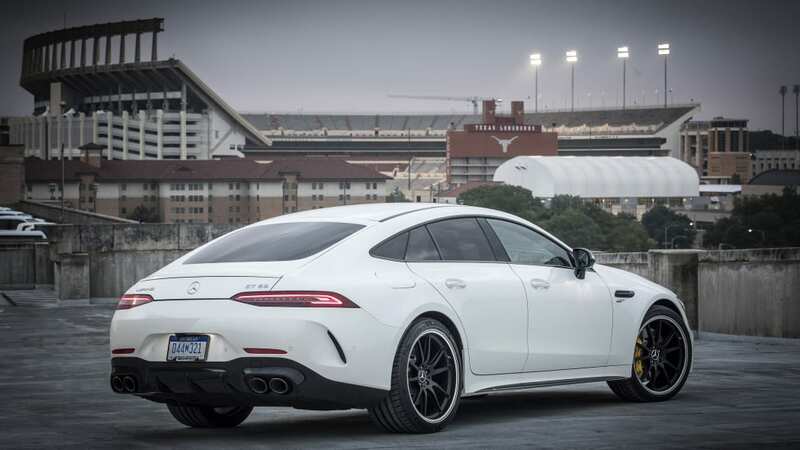 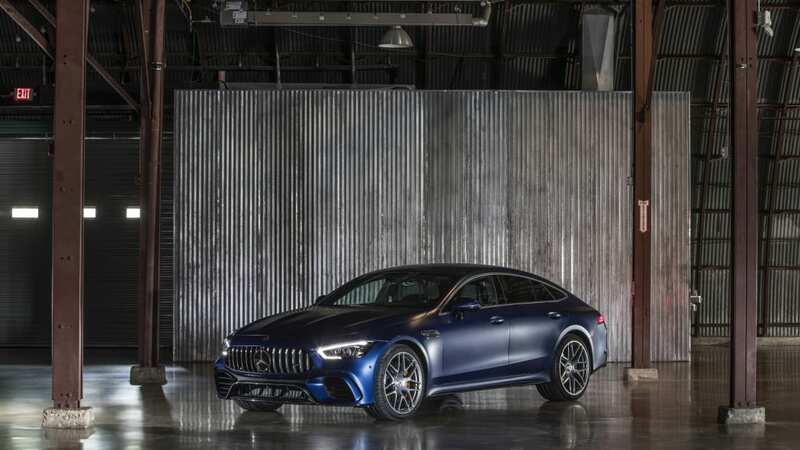 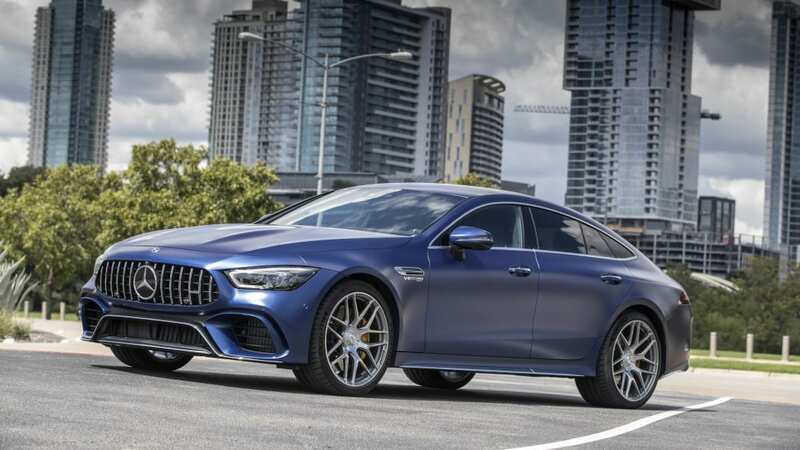 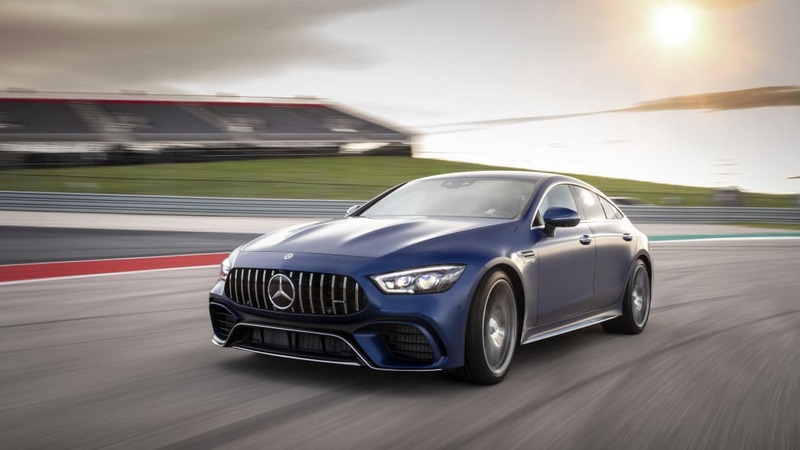 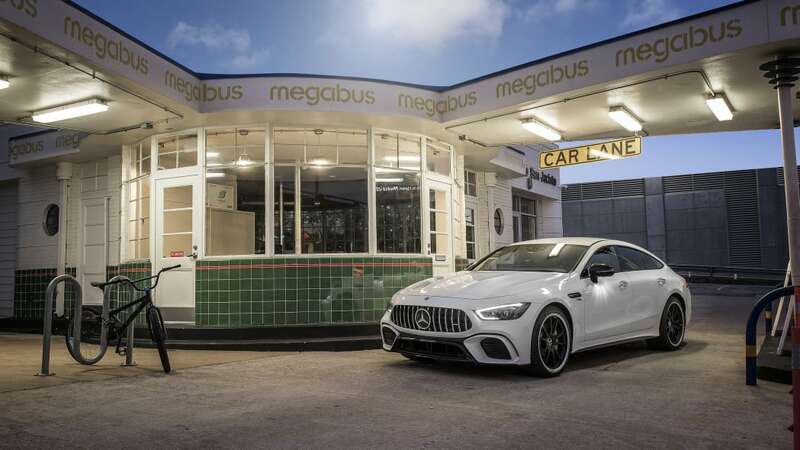 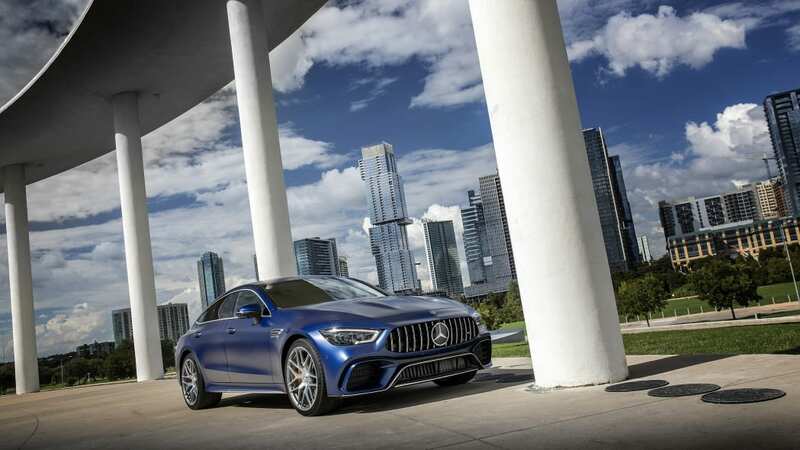 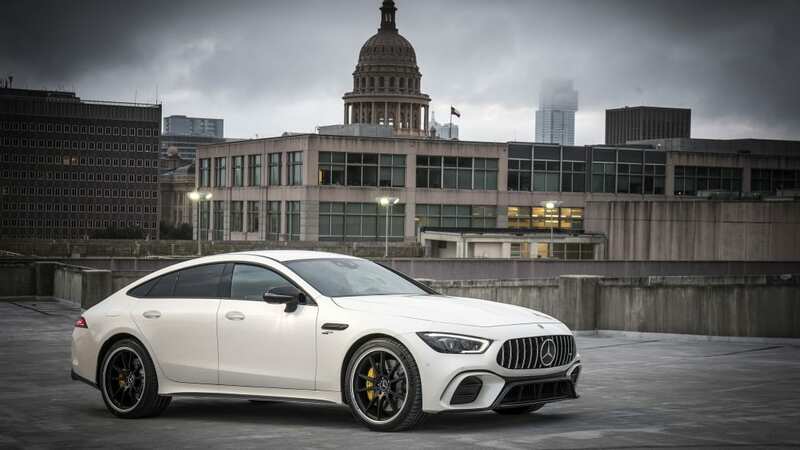 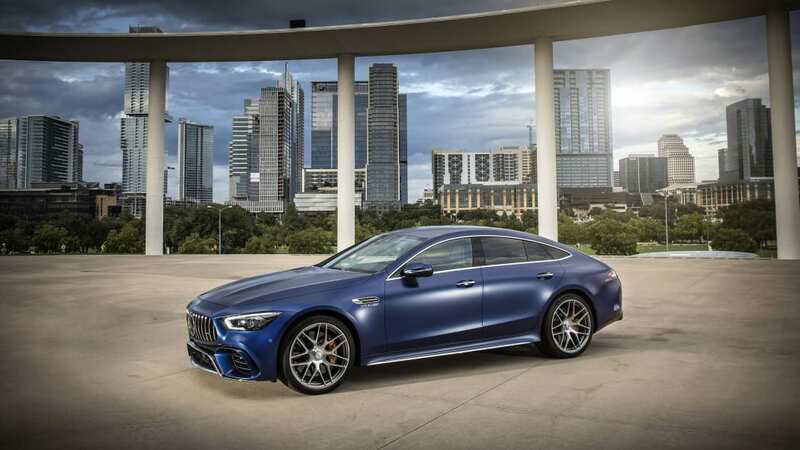 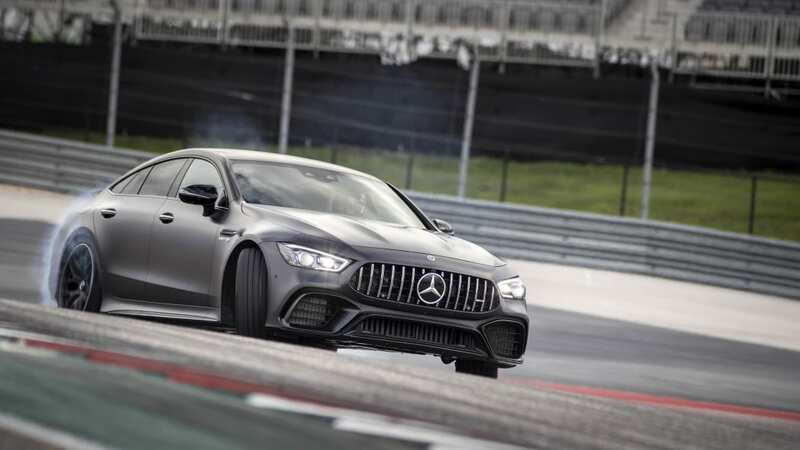 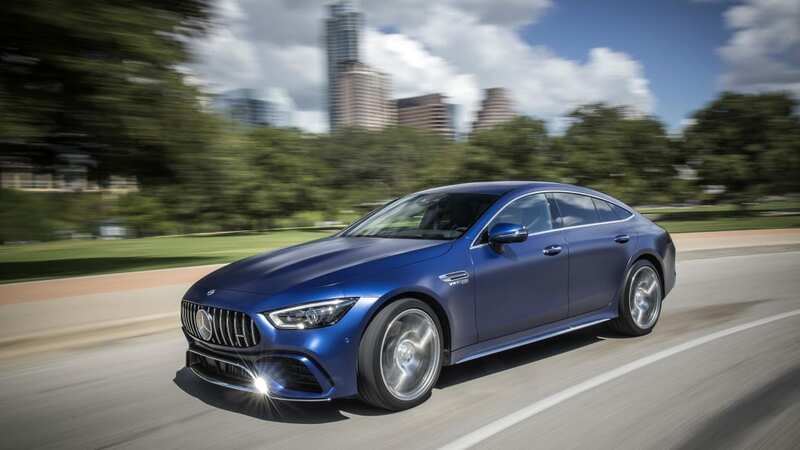 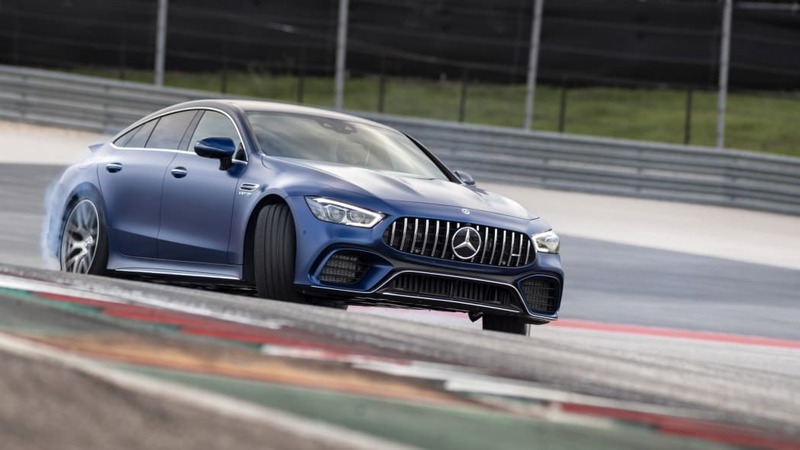 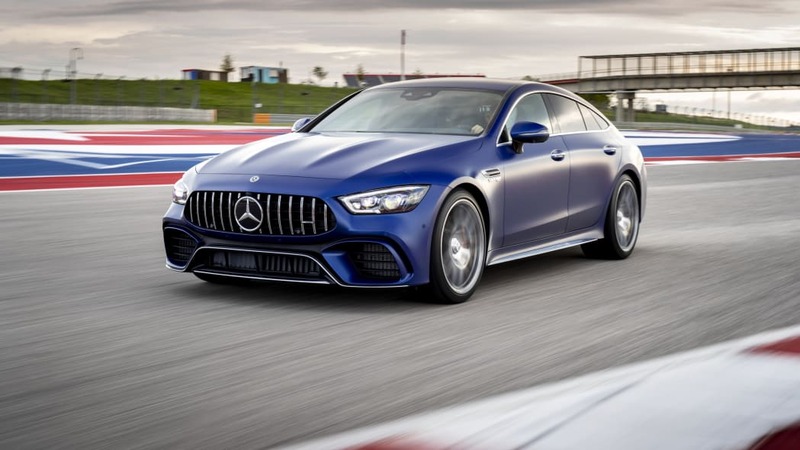 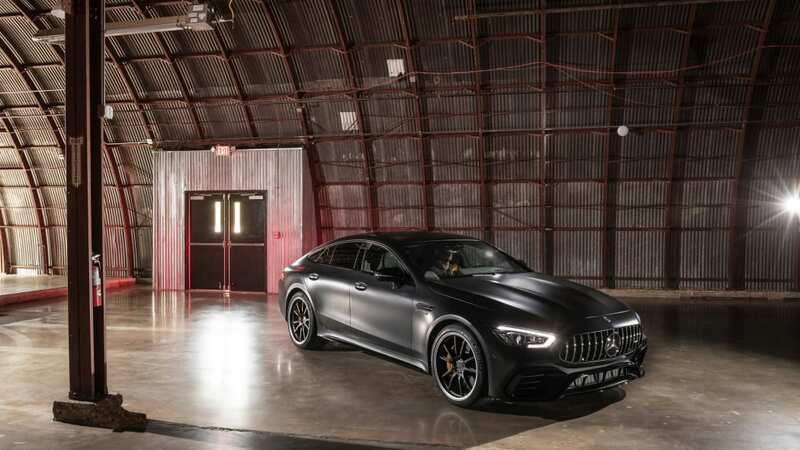 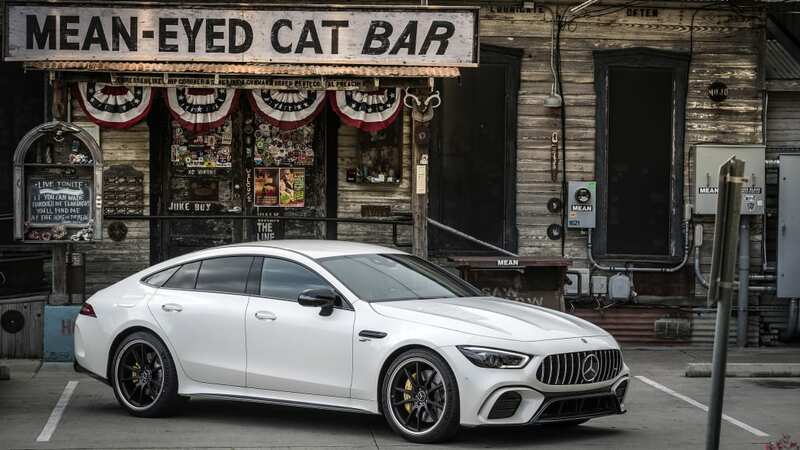 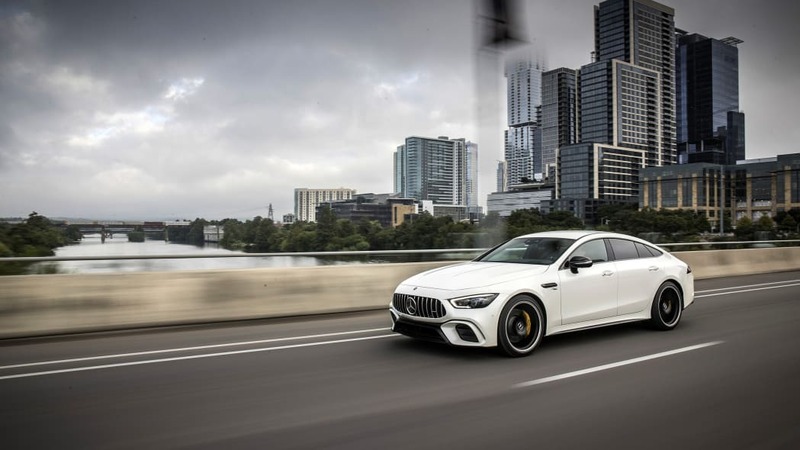 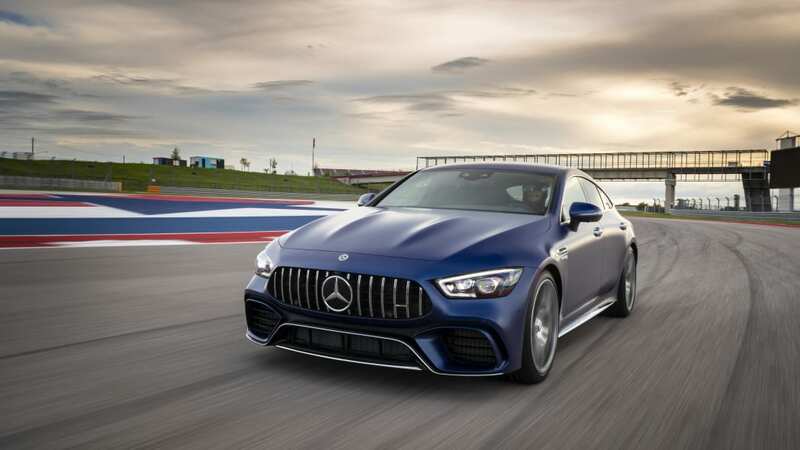 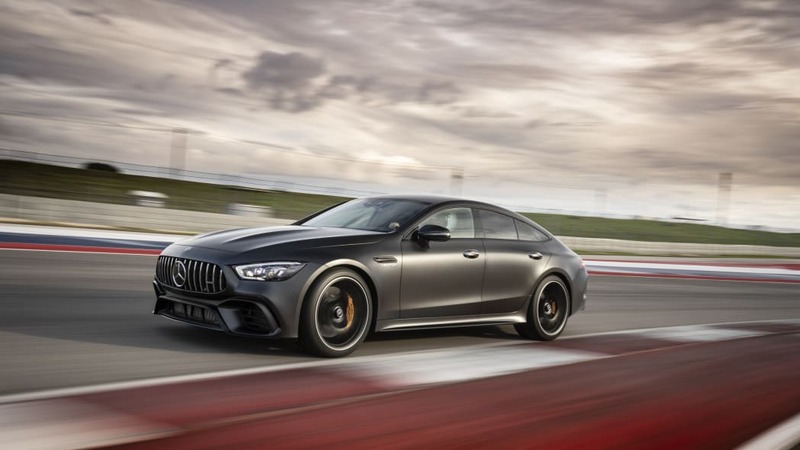 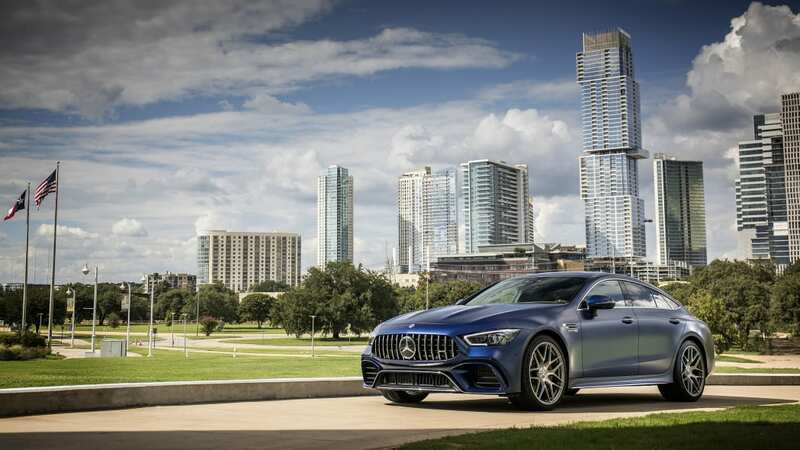 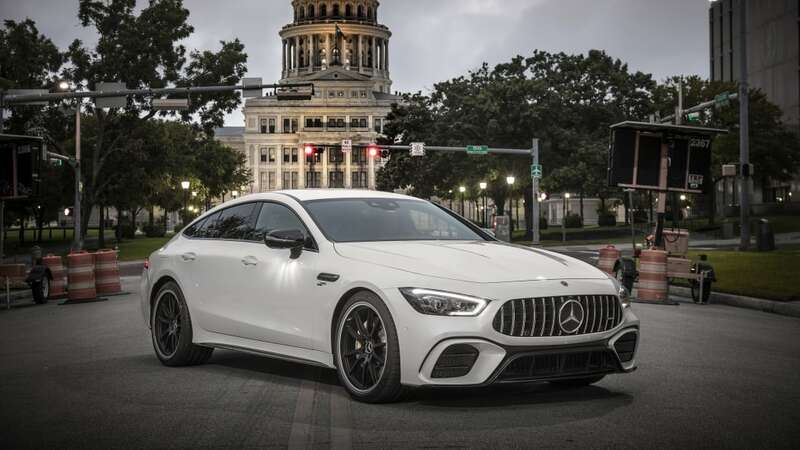 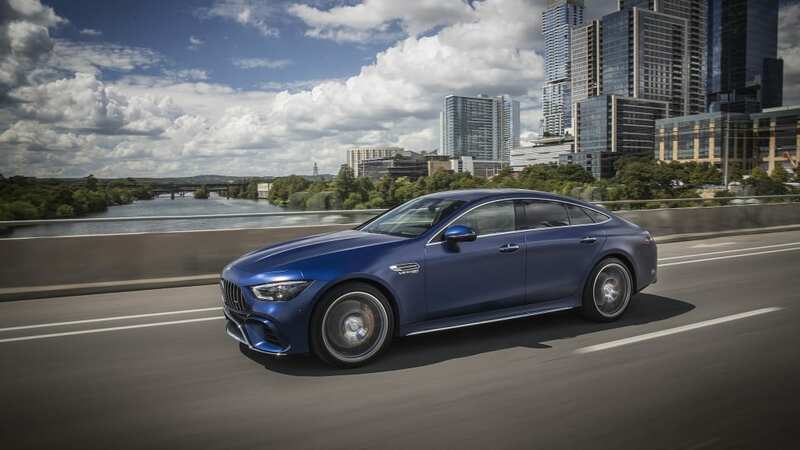 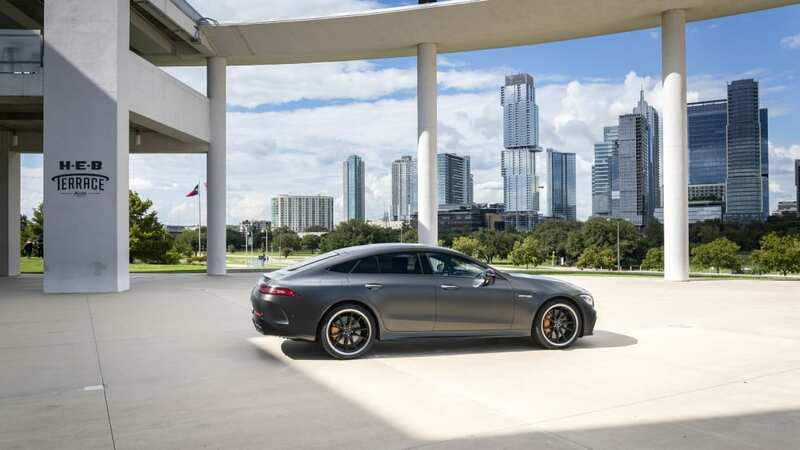 But the new 2019 Mercedes-AMG GT four-door is Mercedes' answer to the Porsche Panamera and the revived BMW 8 Series, and we braved Austin's traffic and a rainstorm that followed us to Circuit of the Americas to see just how well AMG's latest performance car could dance. 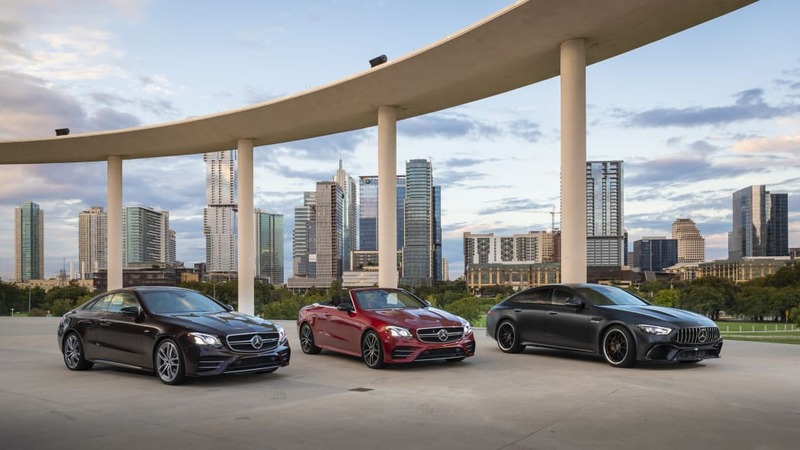 Power has never been an issue. 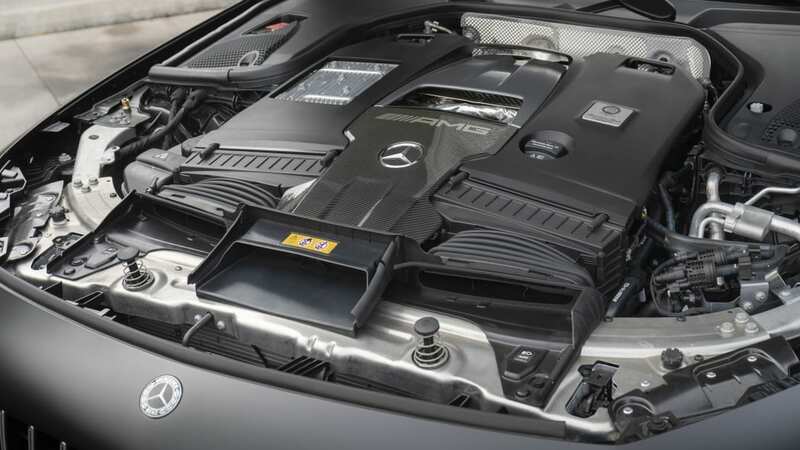 Every AMG engine is work of art, a sweet and torquey ode to internal combustion. 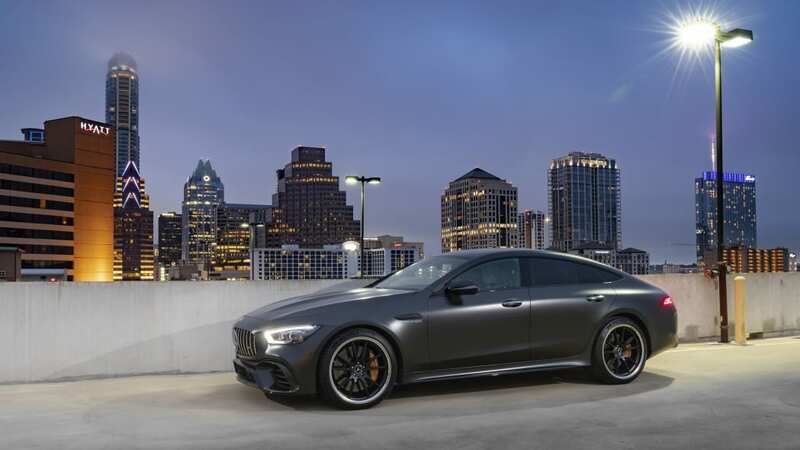 The GT four-door comes in three flavors: GT 53, GT 63 and GT 63 S. The GT 53 uses Mercedes' new 3.0-liter turbocharged inline-six, making 429 horsepower at 6,100 rpm and 384 pound-feet of torque between 1,800 and 5,800 rpm. 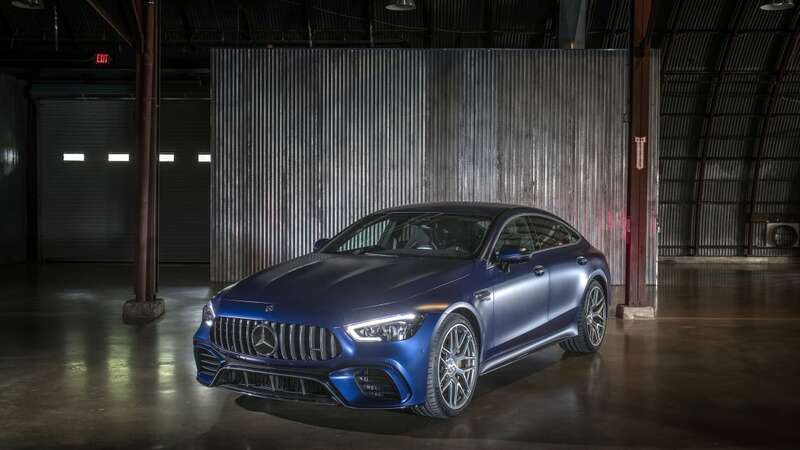 The EQ Boost starter-generator mounted between the engine and transmission accounts for 21 pound-feet of low-end torque while the turbos spool up. 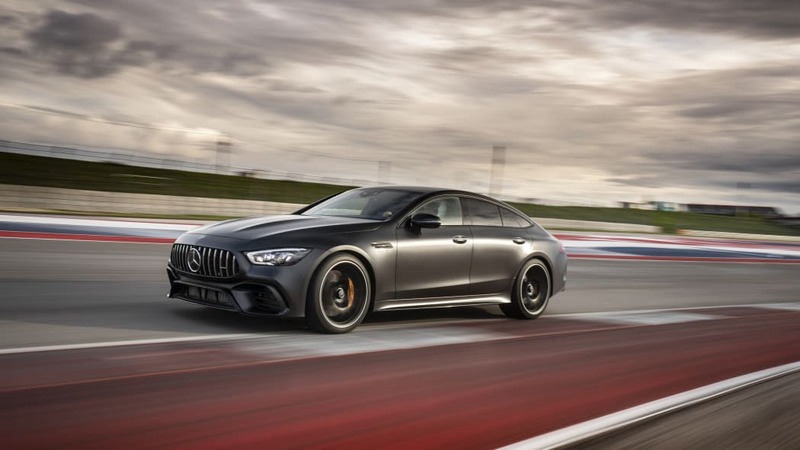 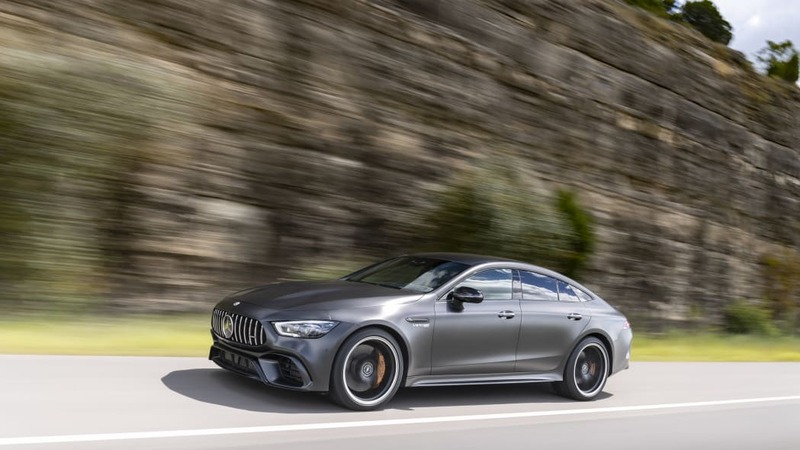 The GT 63 and GT 63 S models use versions of AMG's twin-turbocharged 4.0-liter V8 making either 577 or 630 horsepower from 5,500 to 6,500 rpm and 590 or 664 pound-feet of torque at 2,500 rpm. 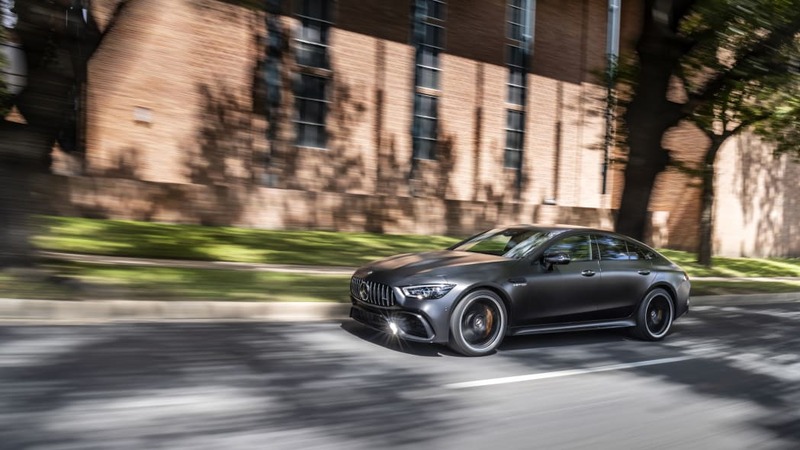 This car effectively replaces the CLS 63 in Mercedes' lineup. 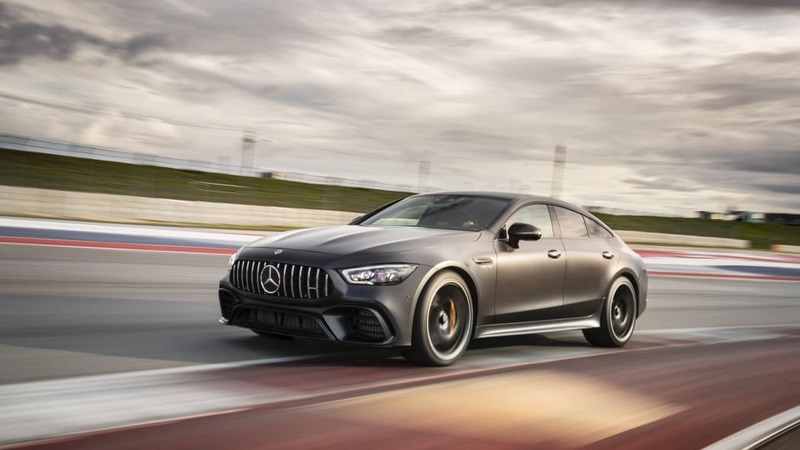 The engine is related to the one found in the AMG GT R coupe, though the four-door model uses twin-scroll turbos with turbine wheels mounted in anti-friction bearings to increase engine response. 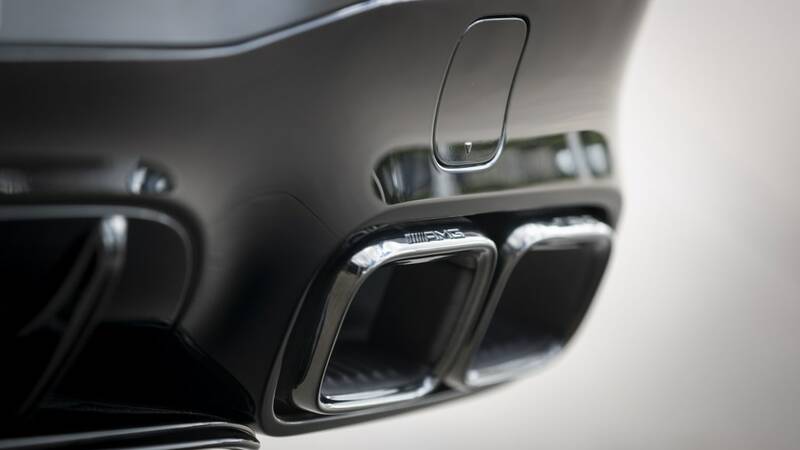 Like the GT coupe, the turbos are mounted between the cylinder banks in a "hot-V" configuration. 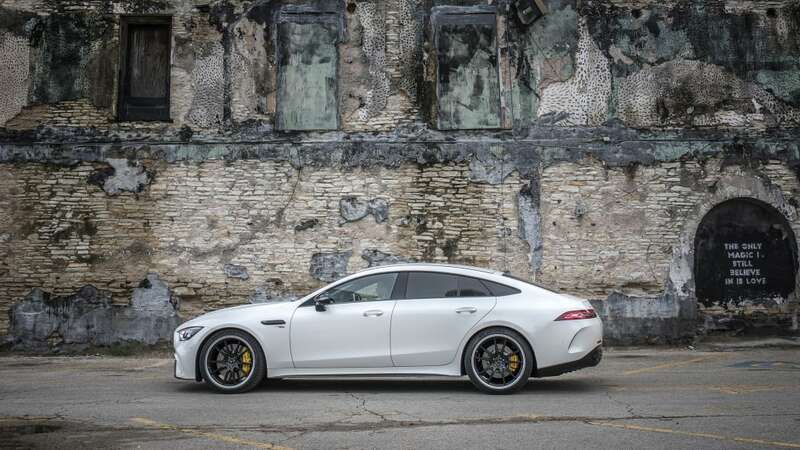 In every GT four-door, power is sent to all four wheels through a nine-speed automatic, though V8-powered models swap out the torque converter for a wet-clutch setup. 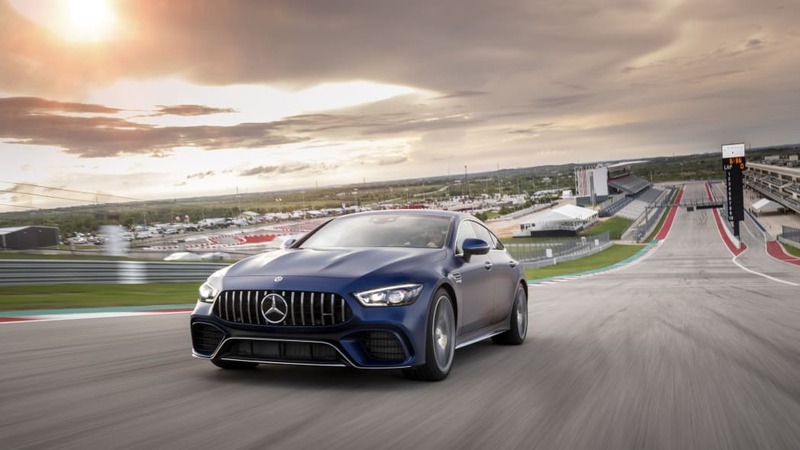 The 4Matic+ all-wheel drive system is tuned for performance, sending power to the front only when necessary as opposed to the full-time system used in other Mercedes. 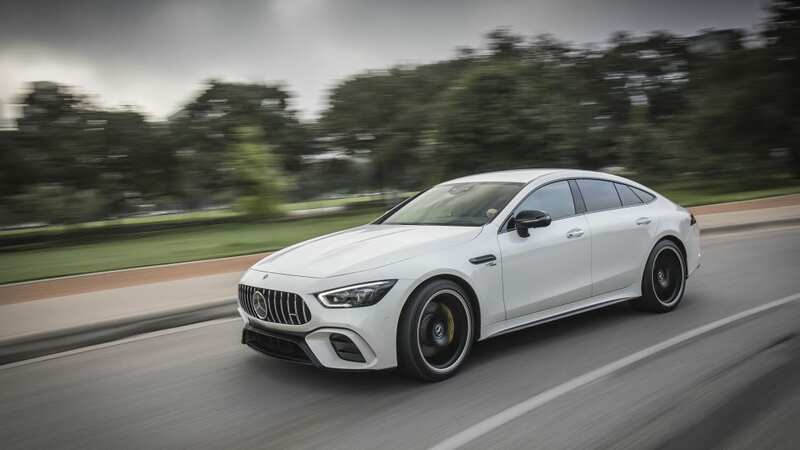 The 63 models have an available "drift mode" that sends all the power to the rear, optional on the 63 and standard on the 63 S.
As with every AMG, acceleration is brutal. 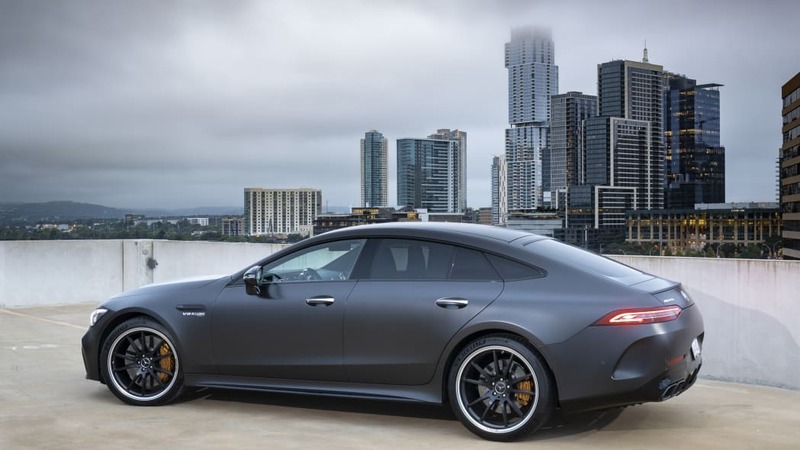 The GT 53 hits 60 mph in 4.4 seconds and is electronically limited to 174 mph. 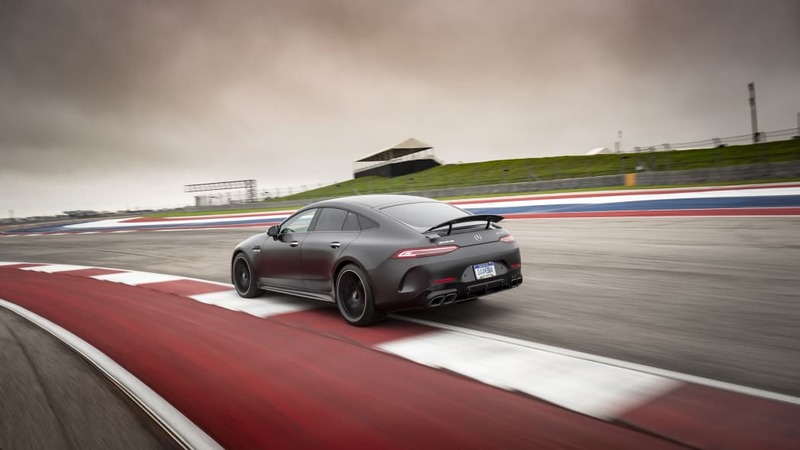 The GT 63 and 63 S cut that 0 to 60 mph time to 3.3 and 3.1 seconds respectively. 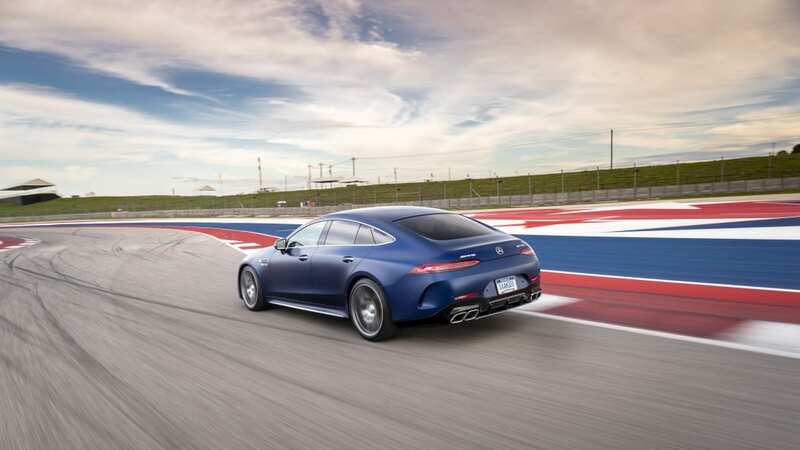 Top speed on the V8 is limited to 195 mph. 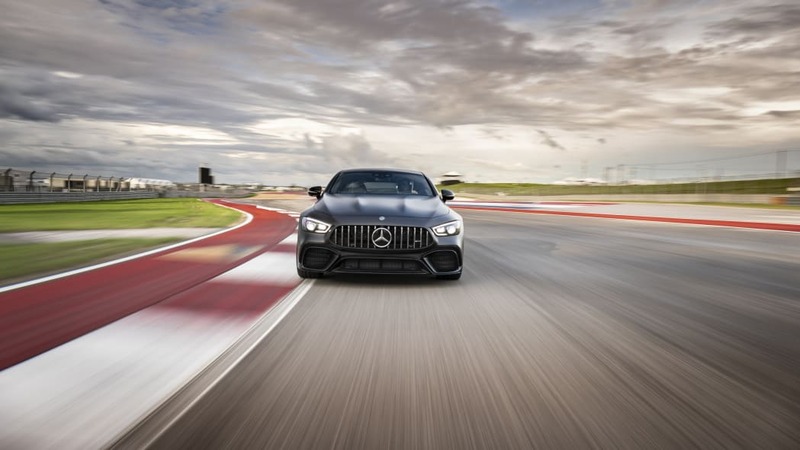 Launch control is easily accessible and allows for repeatable, drama-free runs. 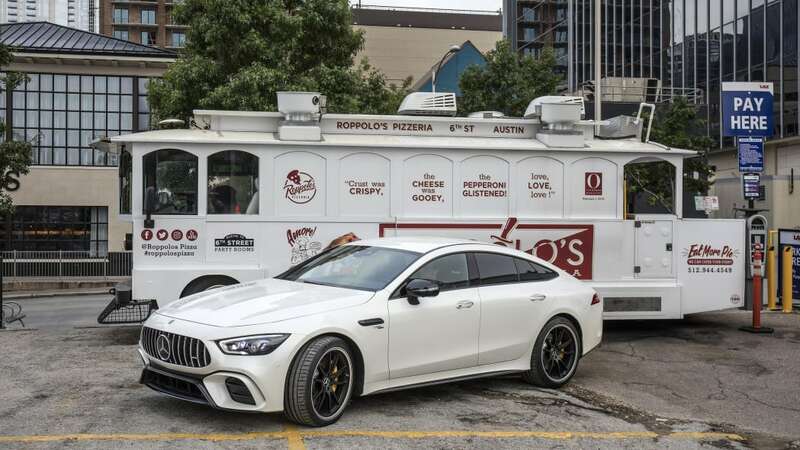 Still, none of that should be news. 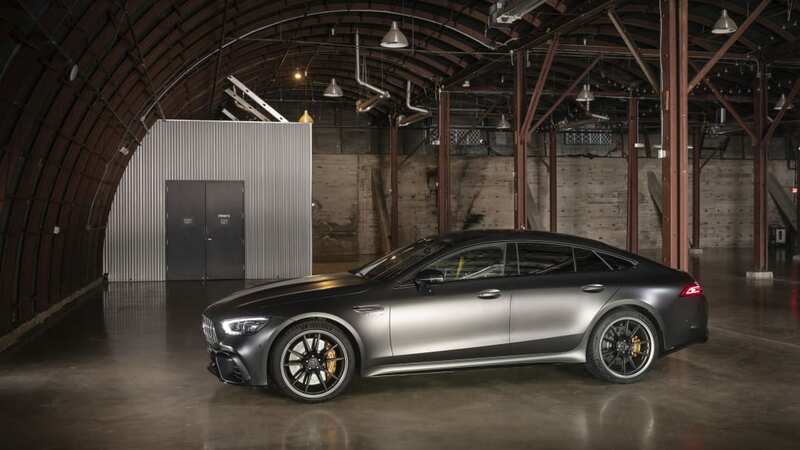 These cars have always had big hearts, but it wasn't until AMG starting designing and building vehicles from the ground up (as opposed to modifying existing platforms) that they achieved world-class handling. 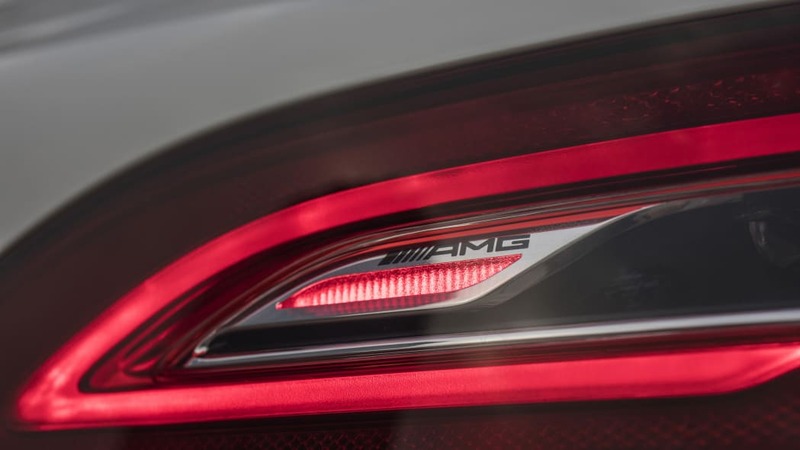 The SLS AMG was the first AMG-developed car. 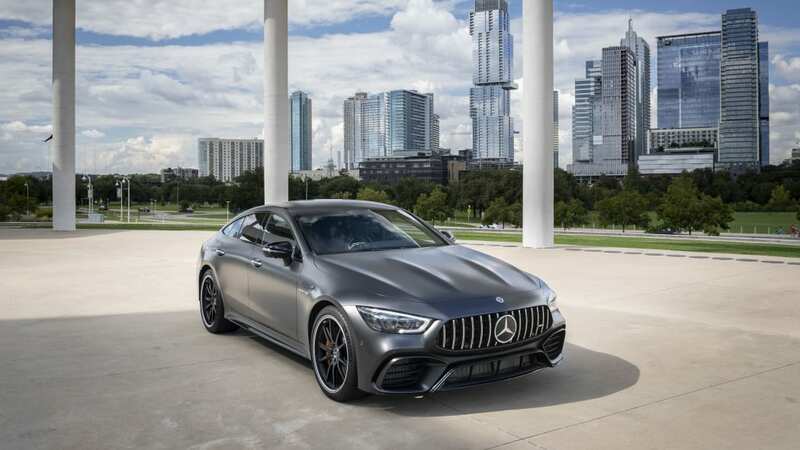 The GT series is the second. 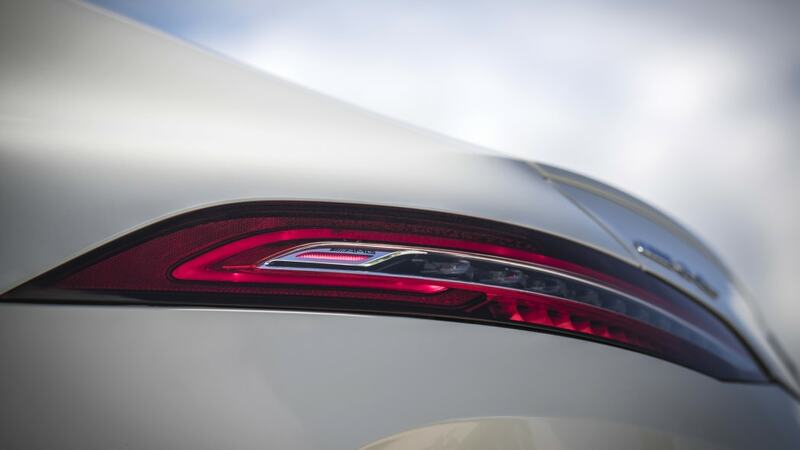 If the SLS was still a little rough around the edges, the AMG GT has been honed to a fine point. 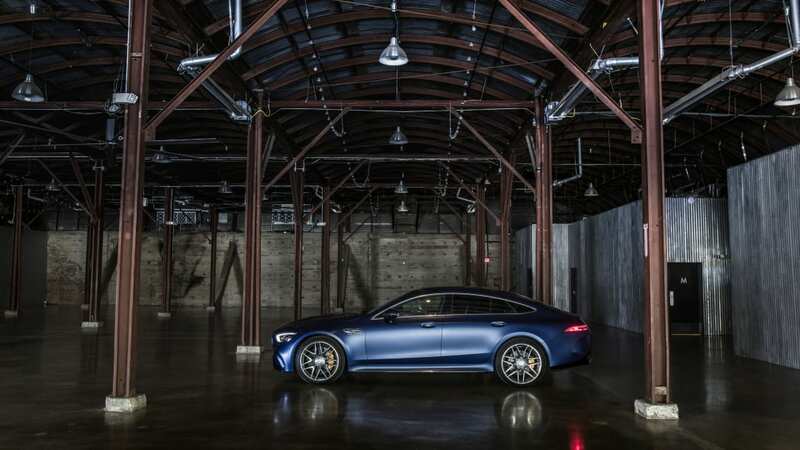 The GT four-door uses two different suspension setups. 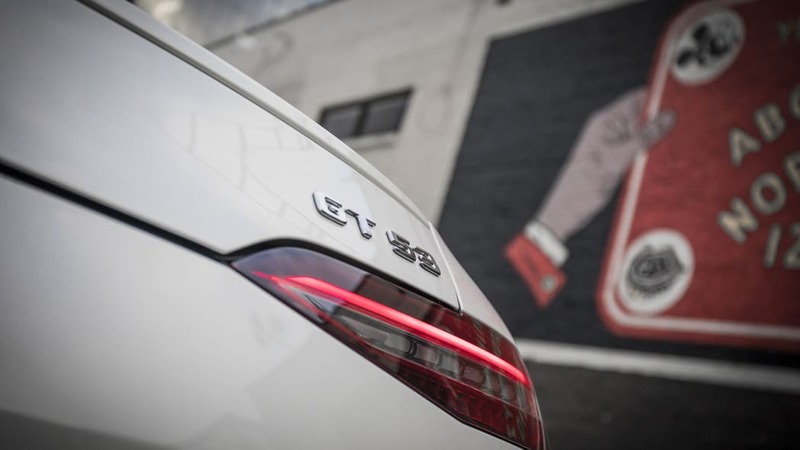 The GT 53 comes standard with AMG Ride Control with steel springs and adaptive dampers. 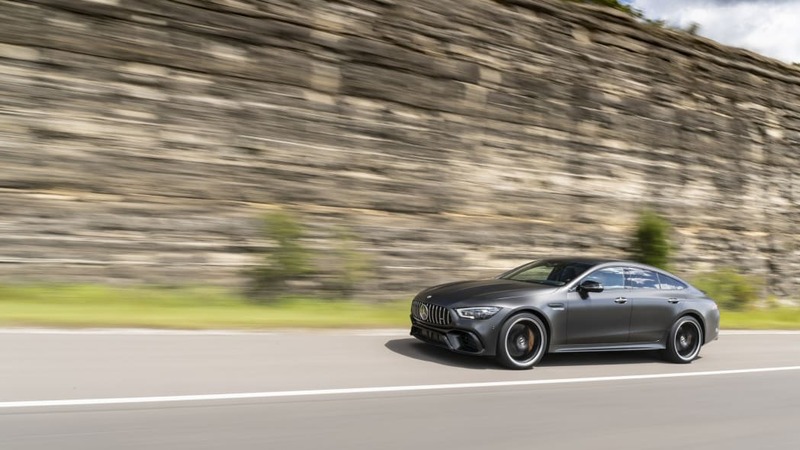 The GT 63 and 63 S use AMG Ride Control+ with multi-chamber air suspension and adaptive dampers. 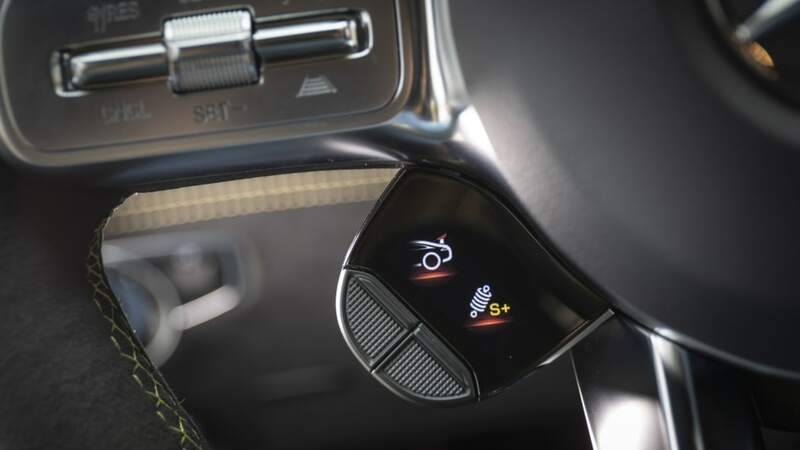 Ride Control+ is optional on the GT 53. 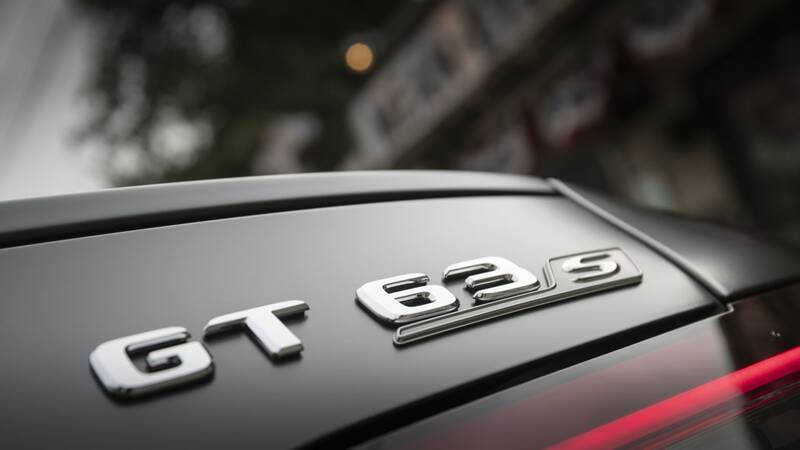 The GT 63 S also gets active engine mounts that adjust firmness based on the drive mode. 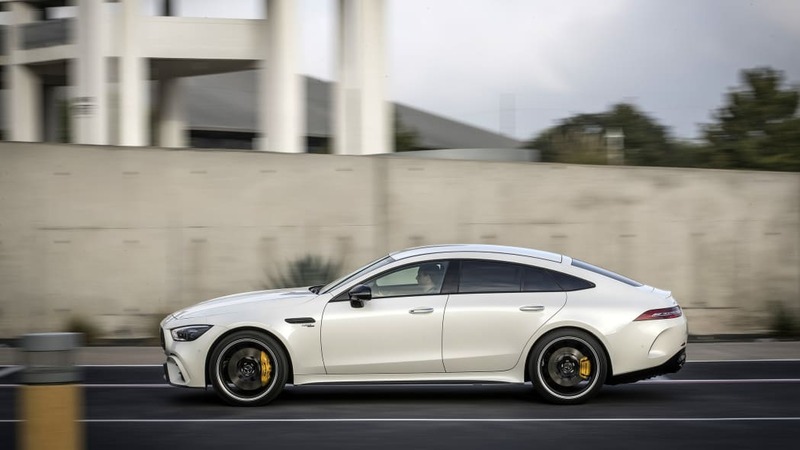 These mounts are optional on the GT 63. 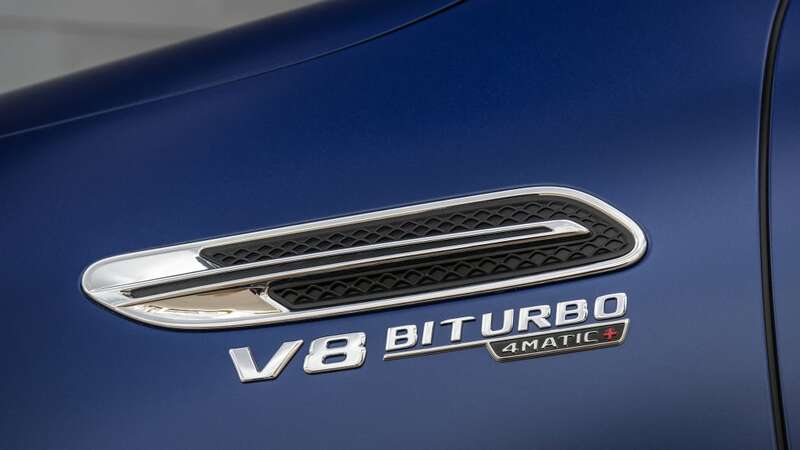 V8-powered cars also come standard with an electronically controlled limited-slip differential and rear-axle steering. 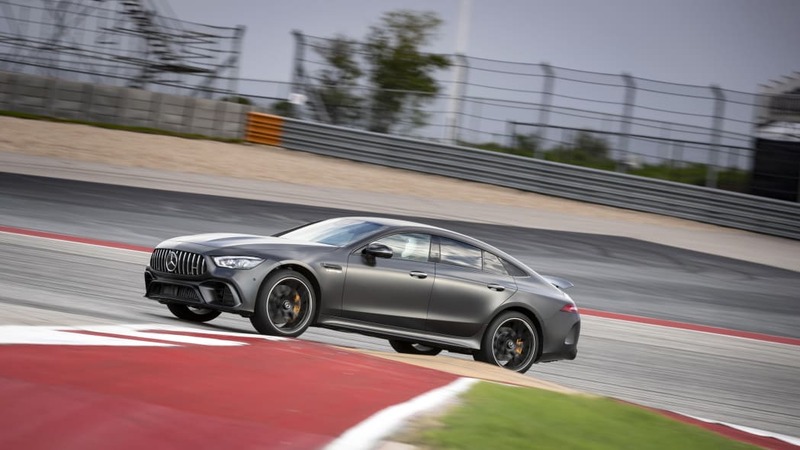 The GT 53 gets a mechanical limited-slip, and rear-axle steering can be optioned. 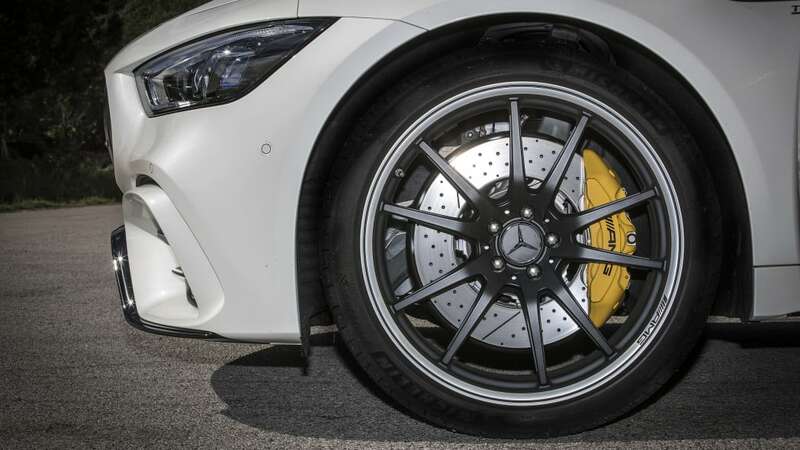 All cars use composite front brake discs with six-piston fixed calipers, though only the 63 and 63 S have composite rotors in the rear. 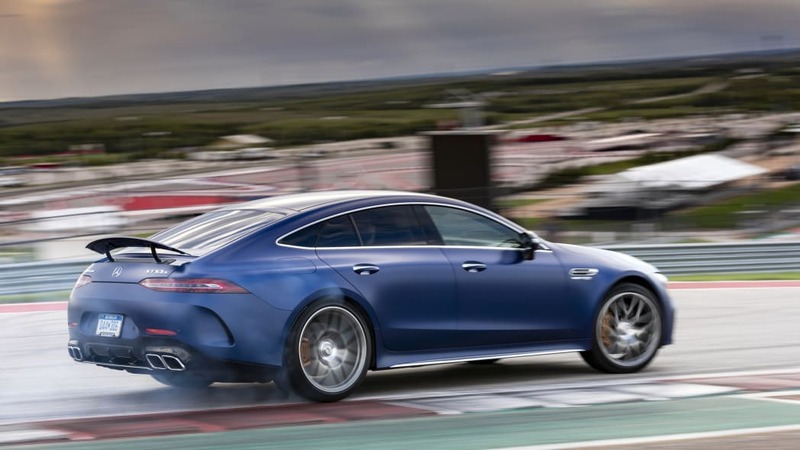 Additionally, all GT four-doors have active aero, with an active rear wing and active shutters in the grille. 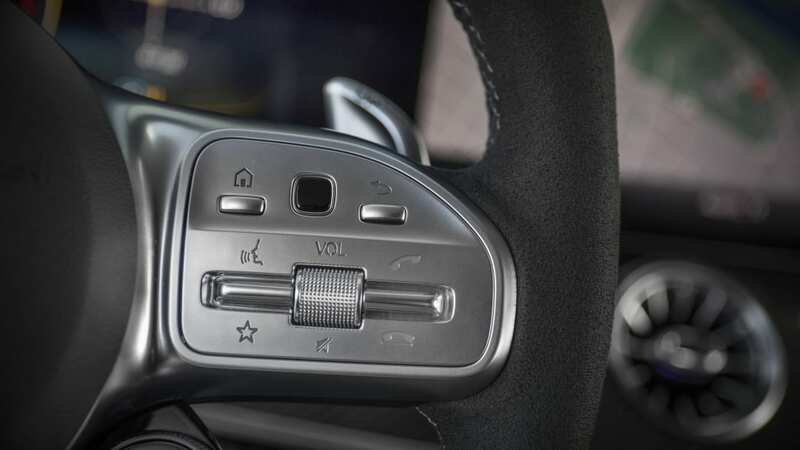 There are also adjustable drive modes: Slippery, Comfort, Sport, Sport+ and Individual. 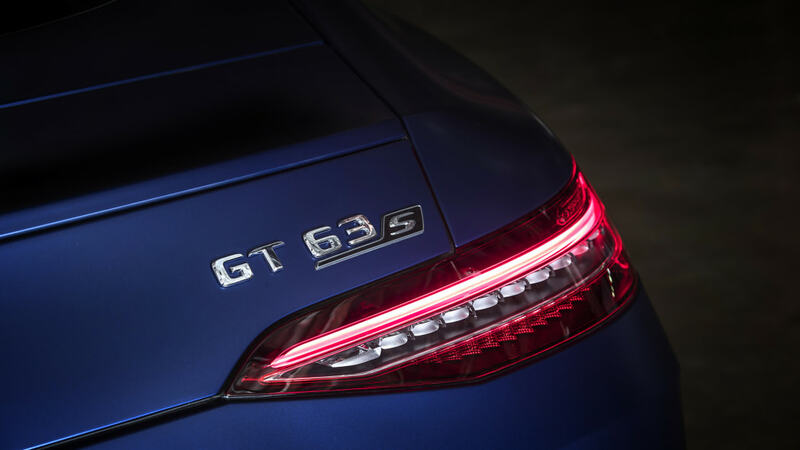 The GT 63 S also gets a "RACE" mode (optional on the non S). 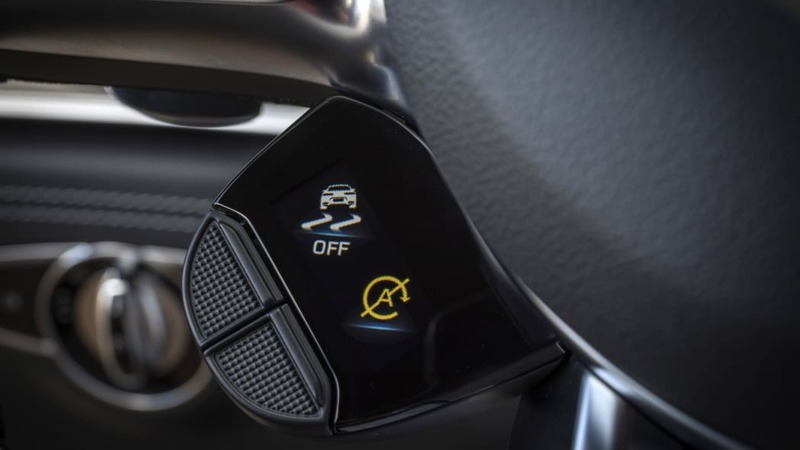 The modes adjust throttle response, shifts, suspension and steering. 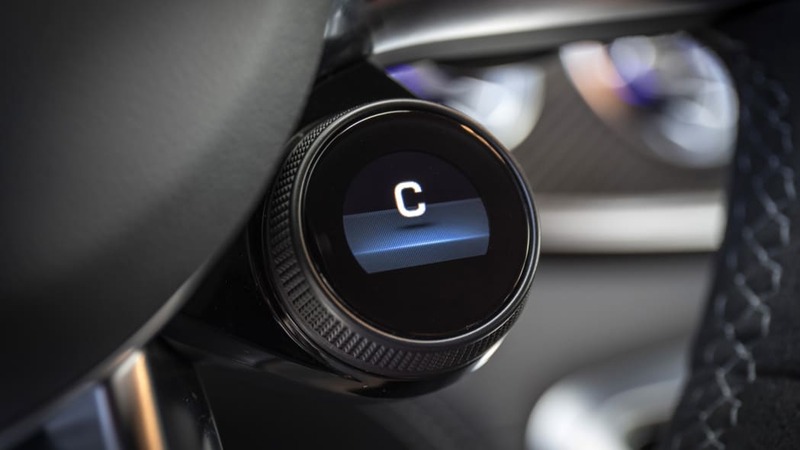 The drive modes can be selected by a toggle on the center console or — on the GT 63 S — using a very Porsche-like knob on the steering wheel. 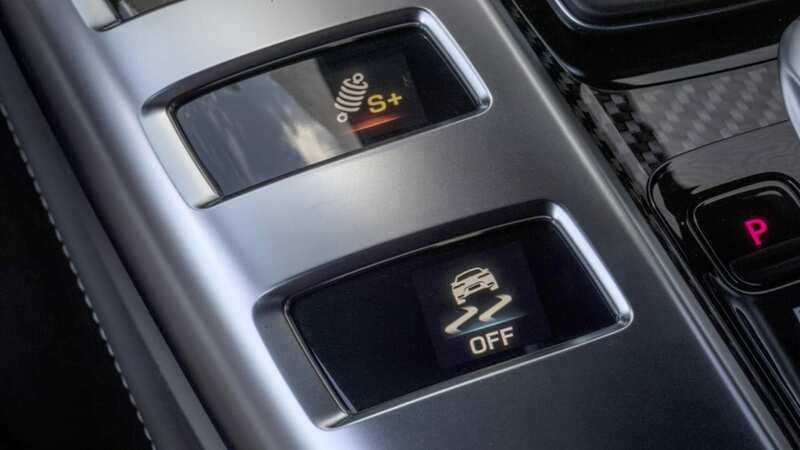 Opposite the knob, there are two configurable buttons that can be programed to adjust settings like the exhaust, suspension and stability control. 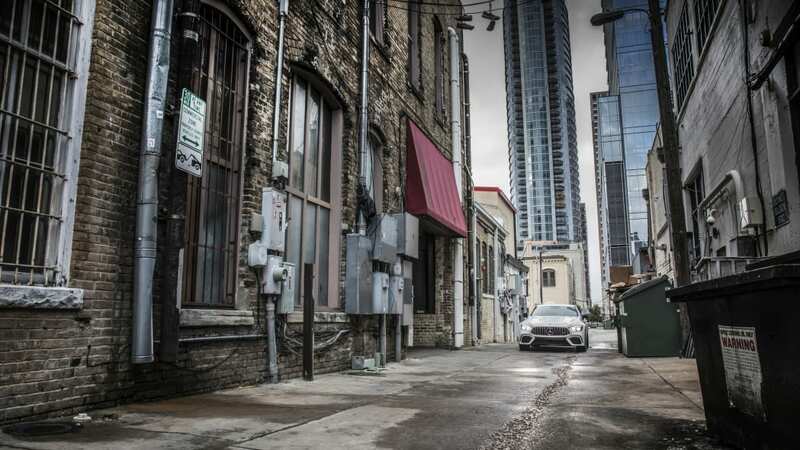 There's a lot going on both above and below the surface, but I'll be damned if it doesn't work. 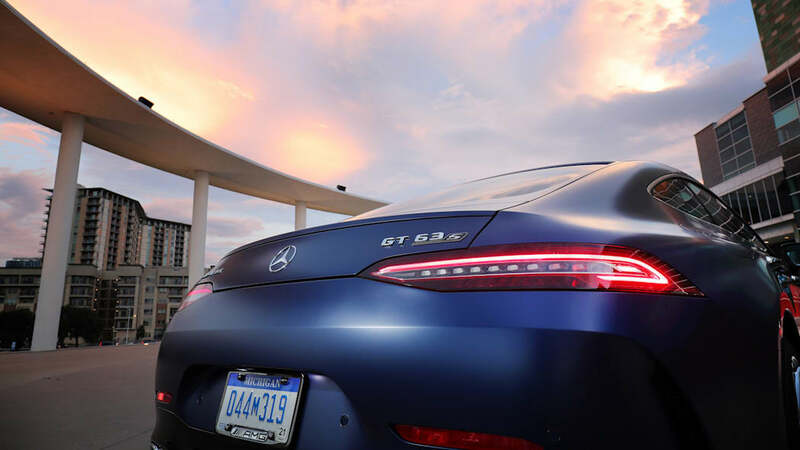 The GT four-door, no matter what engine is under the hood or which drive mode you've selected, is a blast to drive. 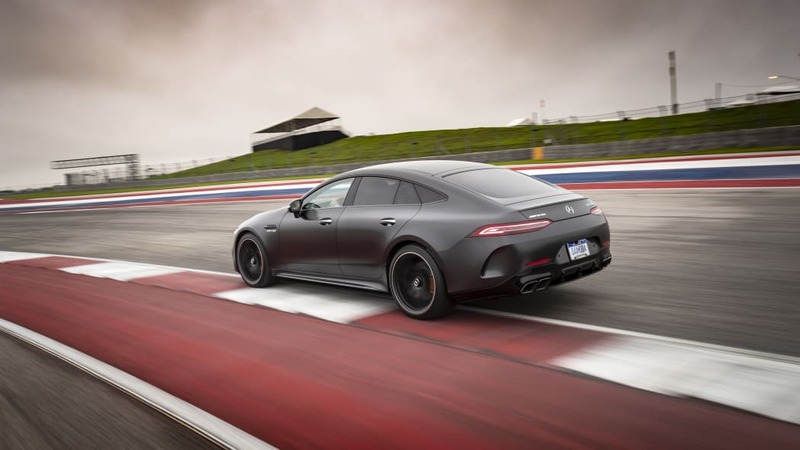 Like other performance sedans (or fastbacks in this case), the car works as well cruising through rain-soaked traffic as it does weaving through the first sector at COTA. 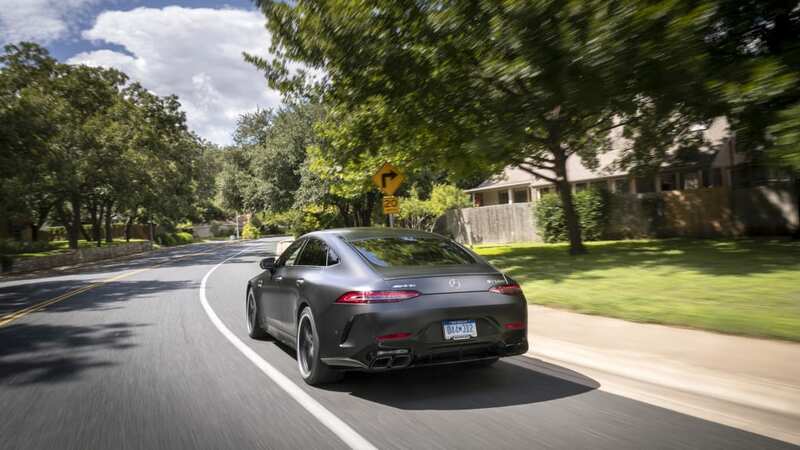 It's not the car that's necessarily optimized for either duty independently, but — like the Porsche Panamera — it does strike a fine balance between the two. 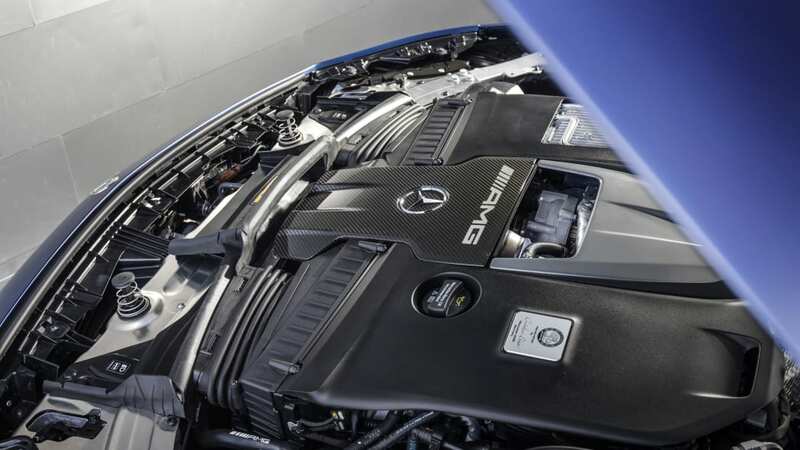 The engines are explosive. 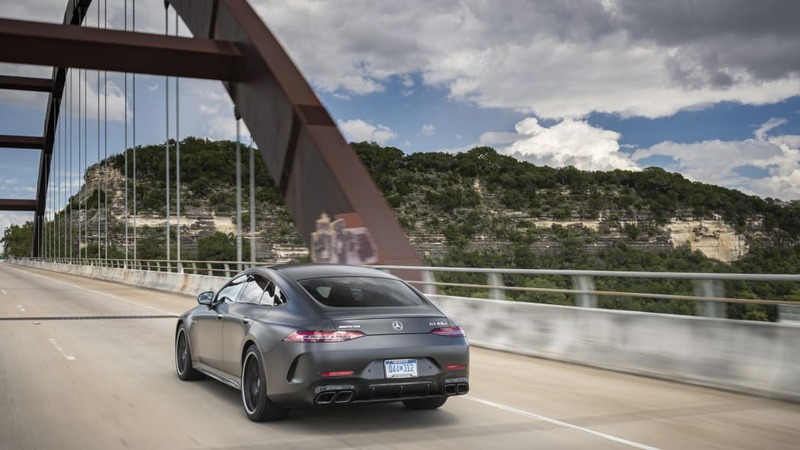 The 4.0-liter revs quickly and eagerly, and thanks to the copious torque curve, there's power whenever and wherever you need it. 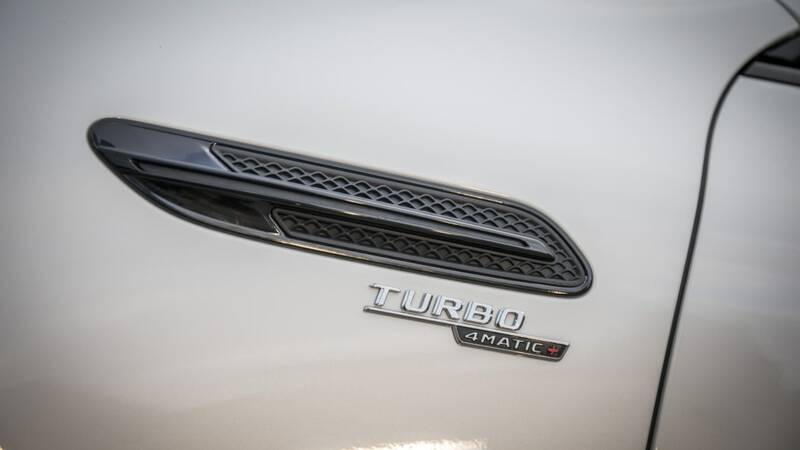 There's little turbo lag thanks to both the turbo placement and the twin-scroll setup. 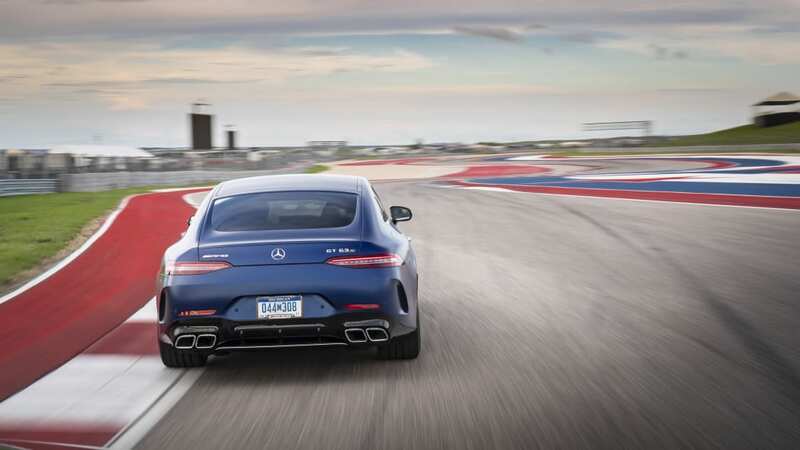 The exhaust note is beastly, doing an impression of an engine with a much larger displacement. 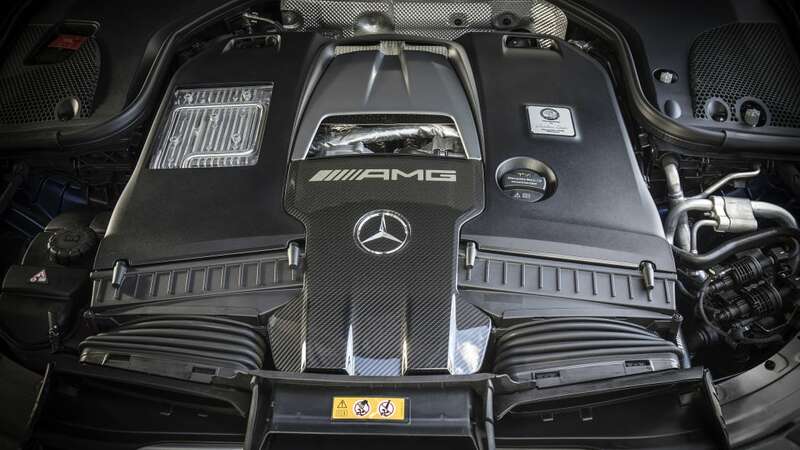 There's even a small whistle from the wastegate. 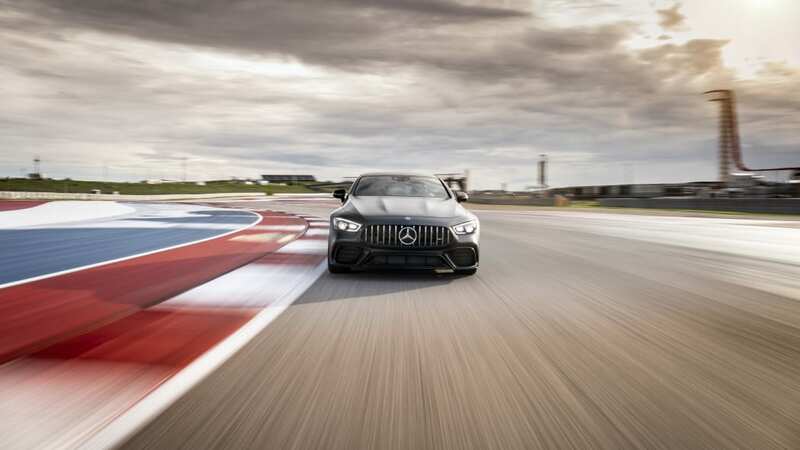 Lay on the power out of turn 11 at COTA and you can kiss 150 mph with ease on the 0.62-mile back straight. 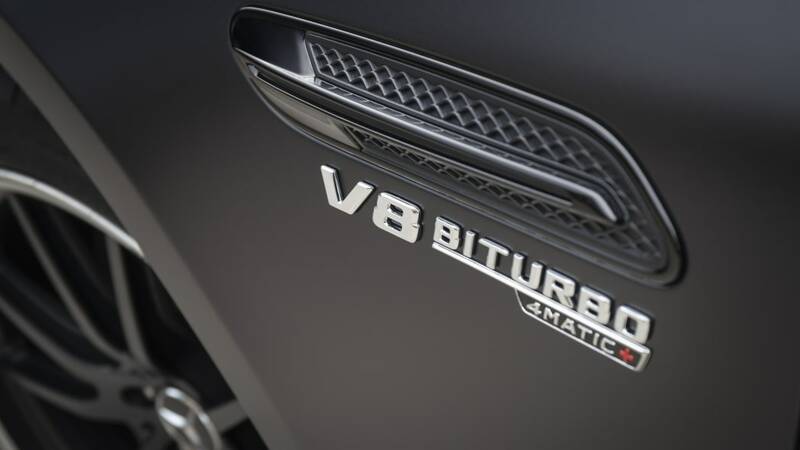 As great as the V8 is, the new inline-six is a real peach. 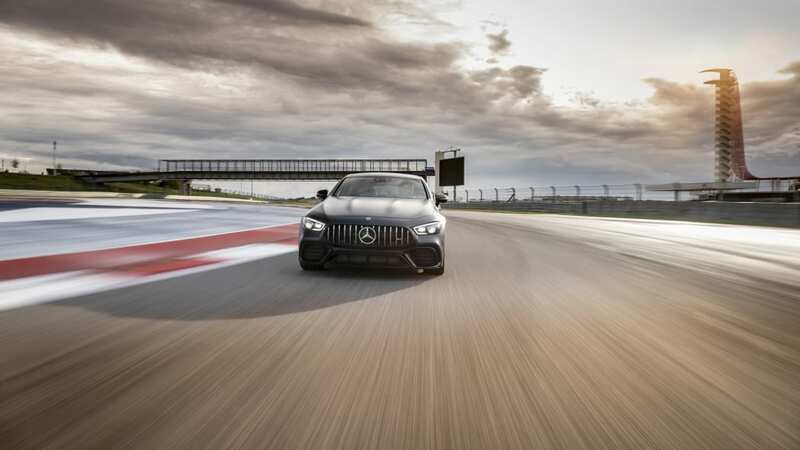 We've tested it in both the CLS 53 and E 53, and the engine always shines brightly. 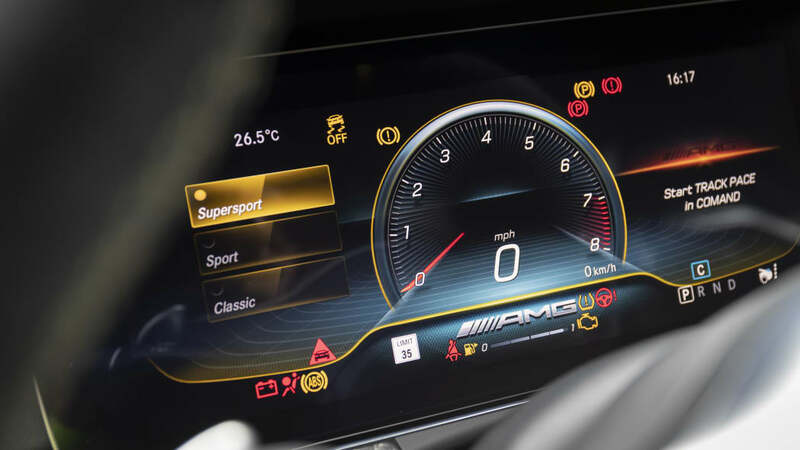 The EQ Boost works magic by filling in low-end torque similar to a McLaren P1. 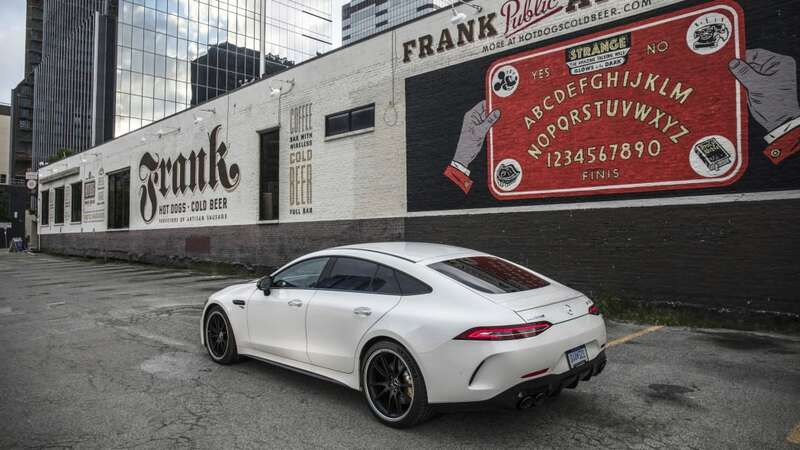 It's nearly as linear as a naturally-aspirated engine because of it. 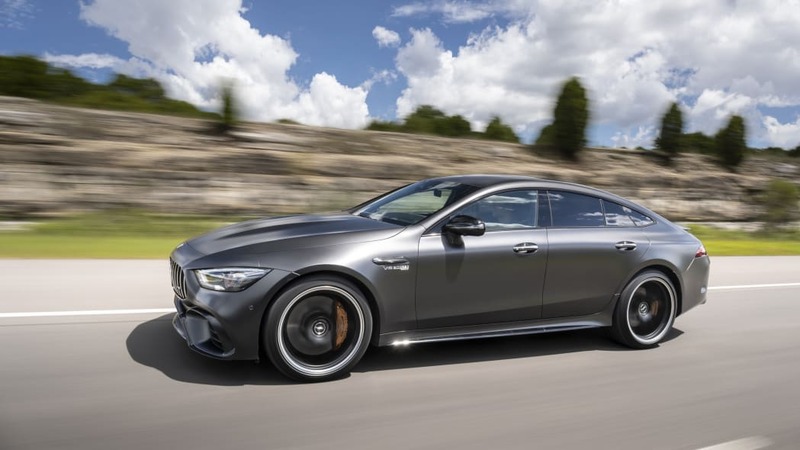 It revs quickly, like all the weight has been removed from the rotating assembly. 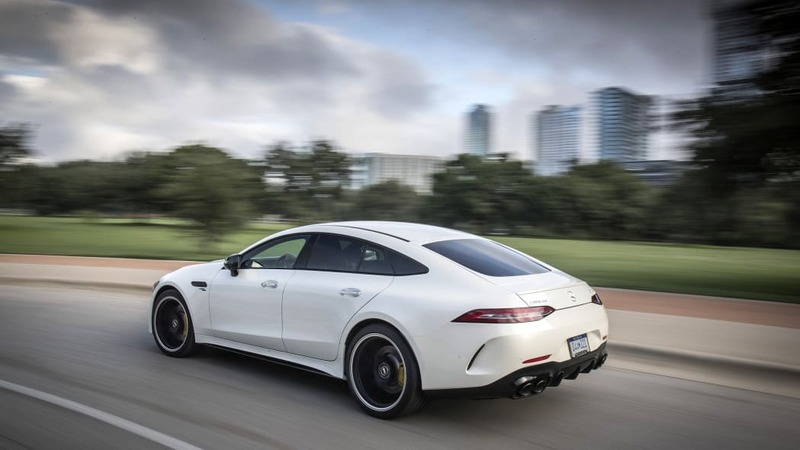 The exhaust sings all the way to redline and exhales in a short burst of sharp cracks when backing off the throttle. 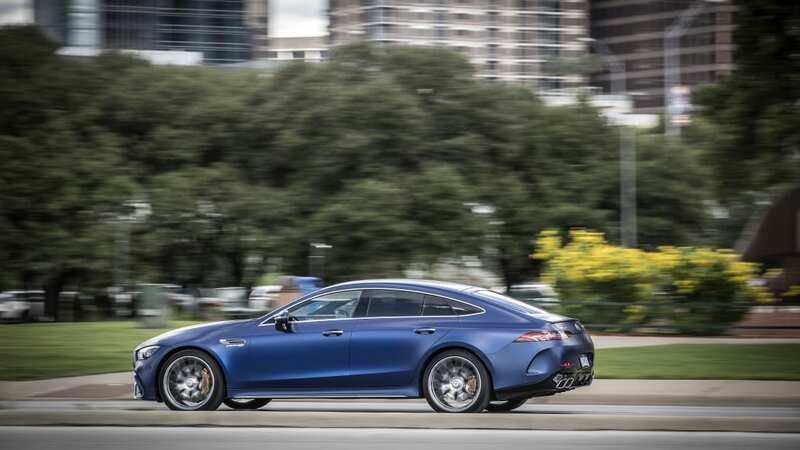 For street use, the 3.0-liter might be my engine of choice. 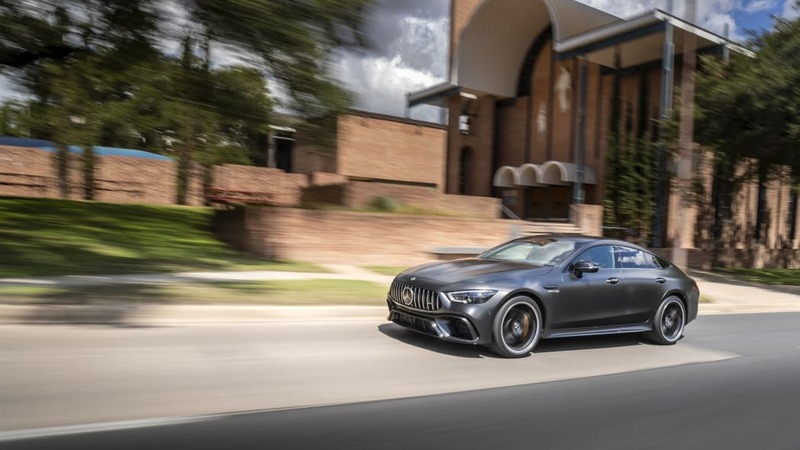 It blows the turbo V6 in the AMG 43 models out of the water, and that's a pretty good V6. 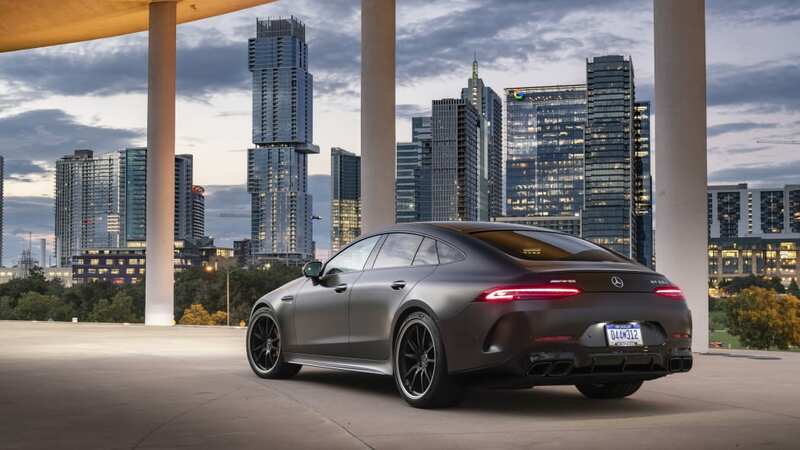 Yes, it doesn't knock you into your seat from a dead stop like the V8, but there's more than enough power for daily duties. 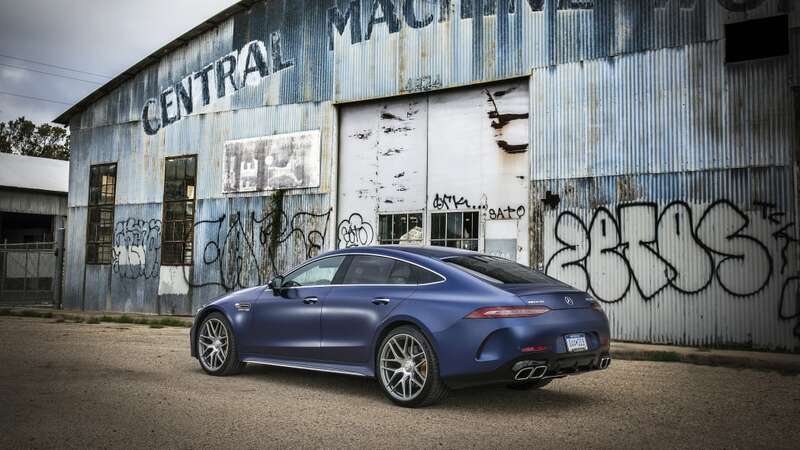 Both on backroads and on the track, the GT four-door moves with a grace that spites its sizable footprint. 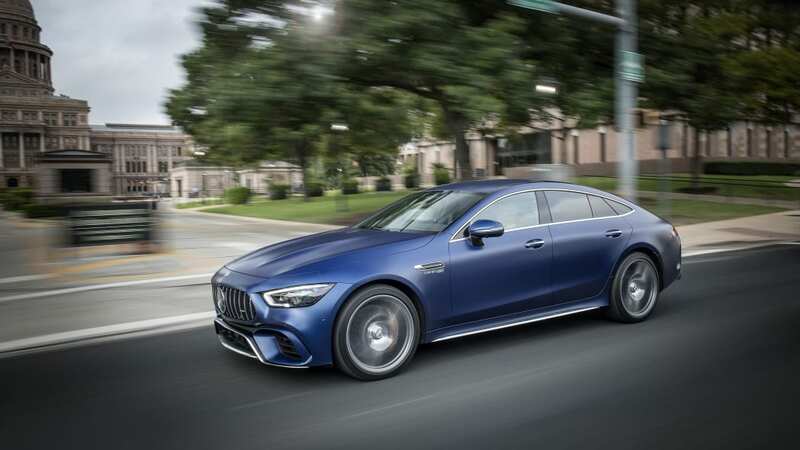 Mercedes hasn't released the car's curb weight, but it's larger in size than an E-Class and close in most aspects to the Porsche Panamera. 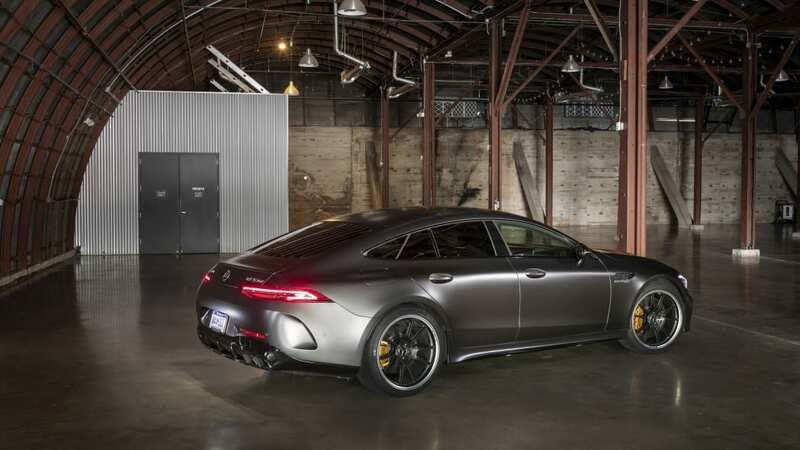 Despite the use of aluminum and carbon fiber, it's not a light car. 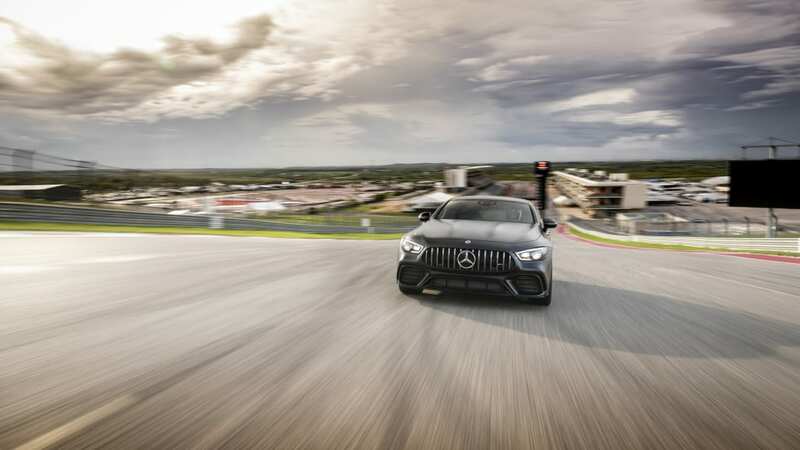 The steering is quick and firm in sport and race modes, delivering plenty of feedback through the Michelin Pilot Sport summer tires. 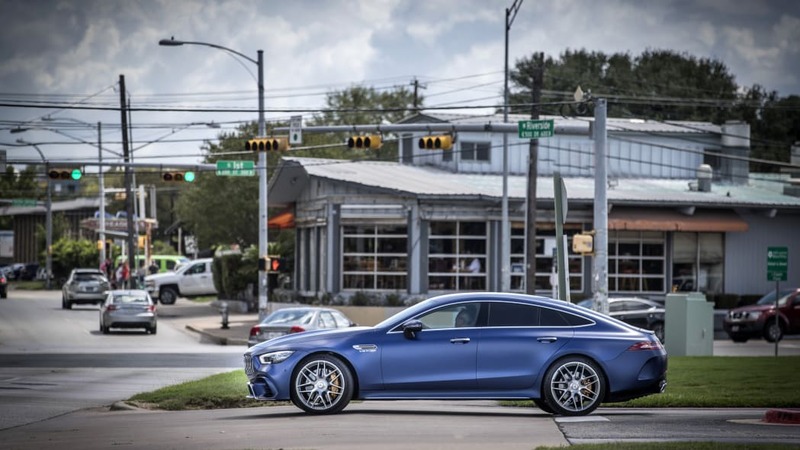 It's not as communicative as the Panamera's or GT coupe's, but it does rival the new BMW M5. 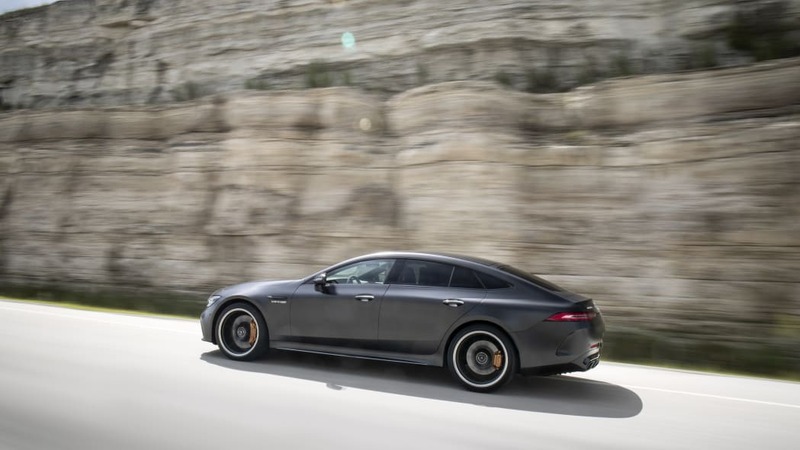 The rear-axle steering works unobtrusively, easing the car around a tight curve and stabilizing it around big ones. 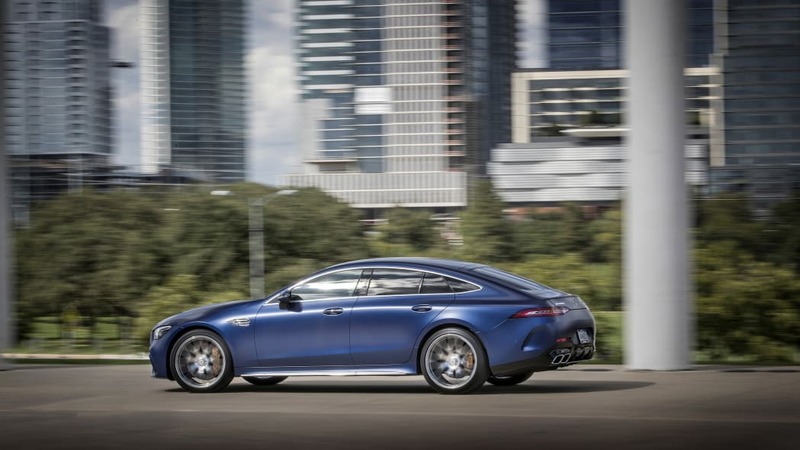 The suspension mitigates body roll, so the car doesn't bend and bob so much as squat and set. 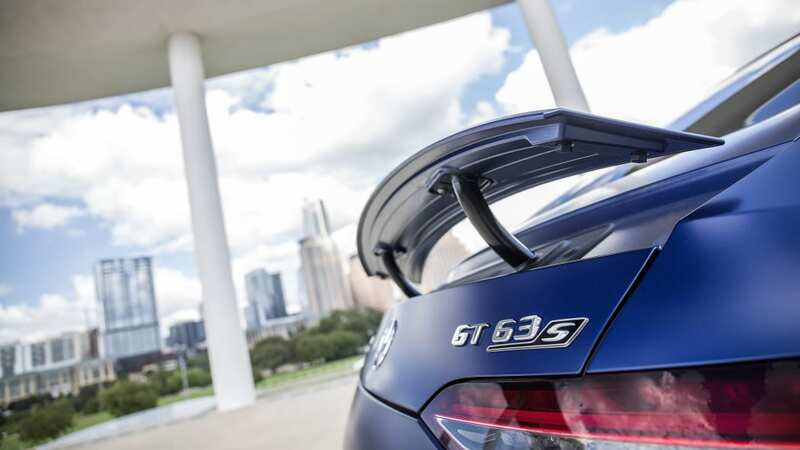 A rear anti-roll bar increases chassis stiffness. 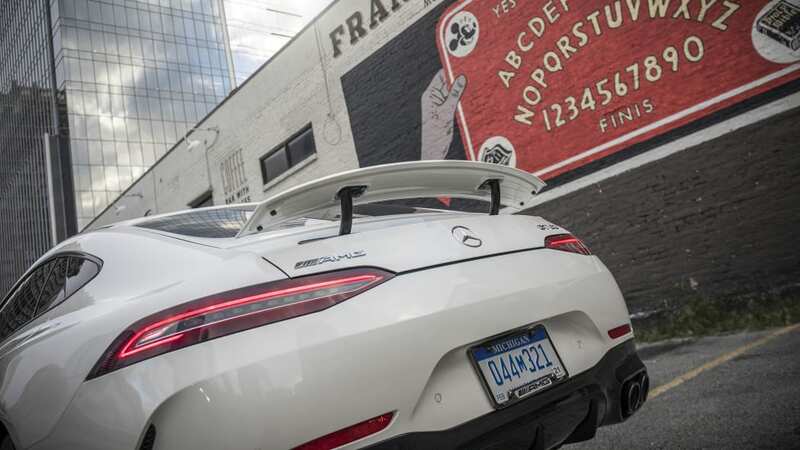 On the road, the car is on the firm side of relaxed. 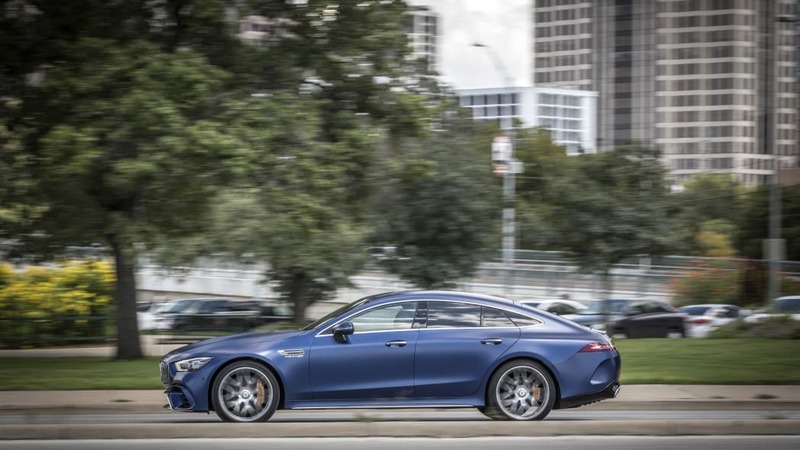 It's not a comfortable as a standard E or S-Class, but it does know how to settle down. 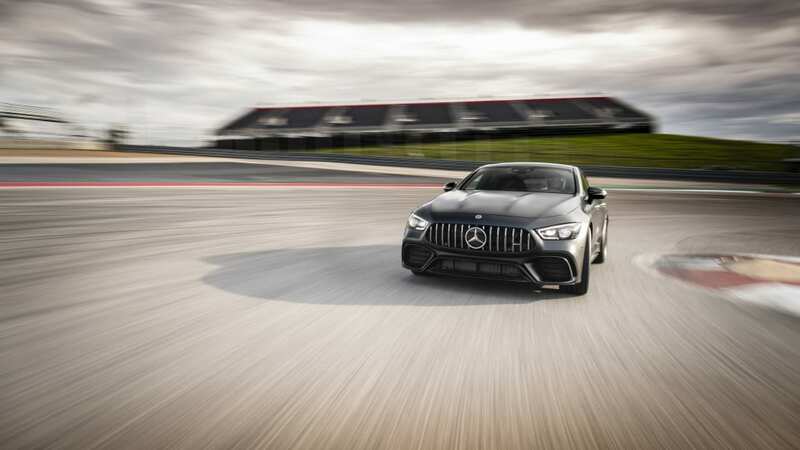 Even with the all-wheel drive system, the car errs toward slight oversteer. 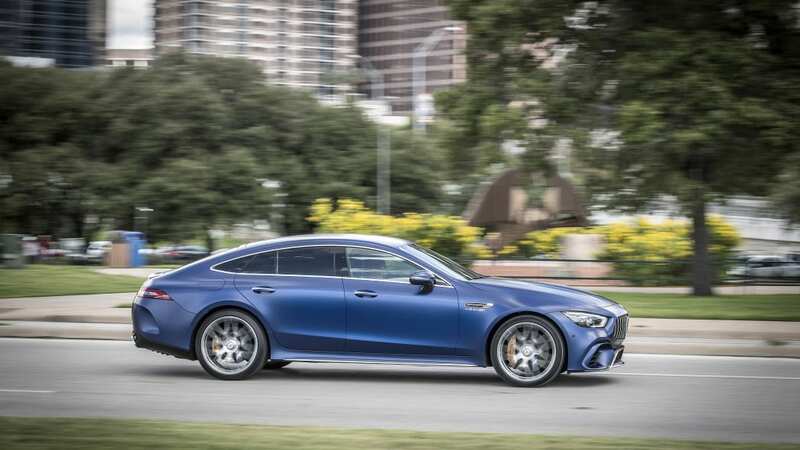 With the stability control backed off, the GT four-door will step out a little, though when the aids come back on they do so with force. 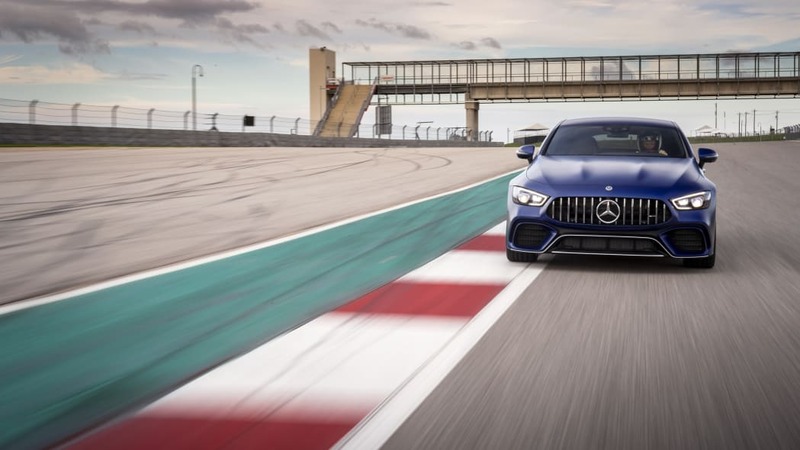 It can interrupt a controlled slide sooner than you might like. 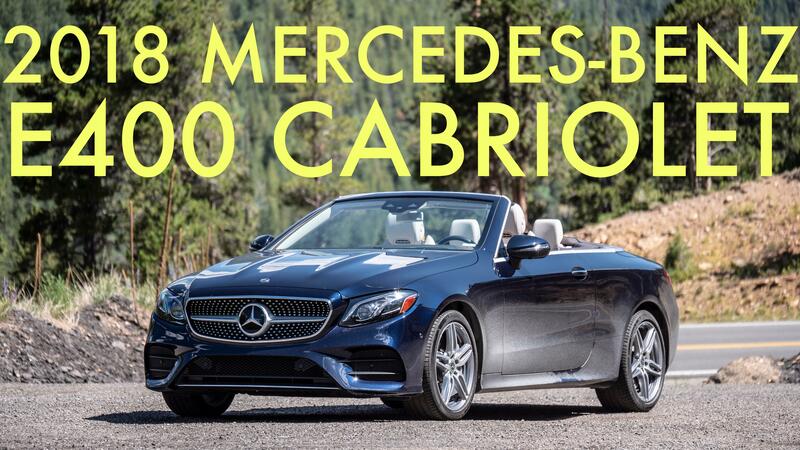 You can disable the system. 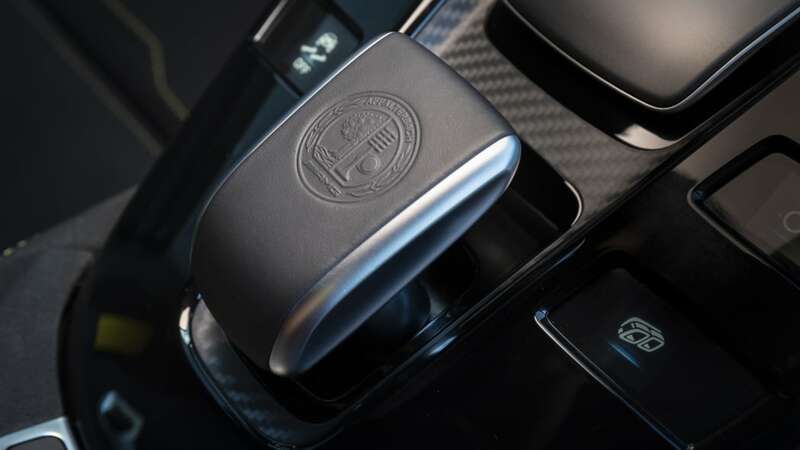 Still, it's hard to argue with the grip. 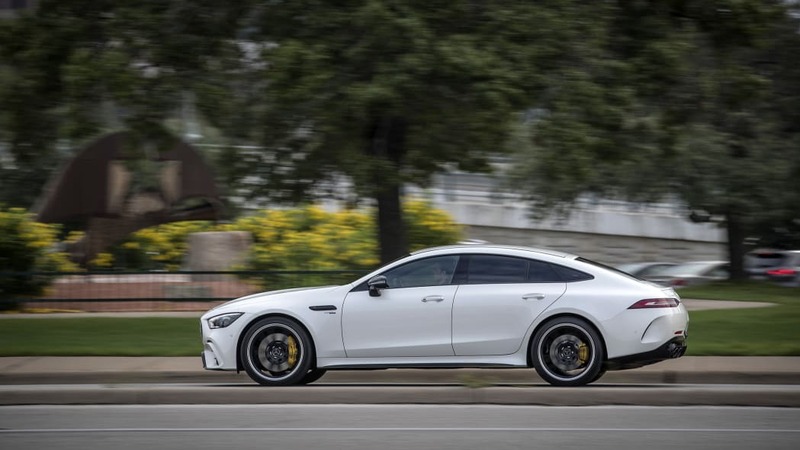 Even when the tires were getting cooked toward the end of the day, the GT four-door plowed on. 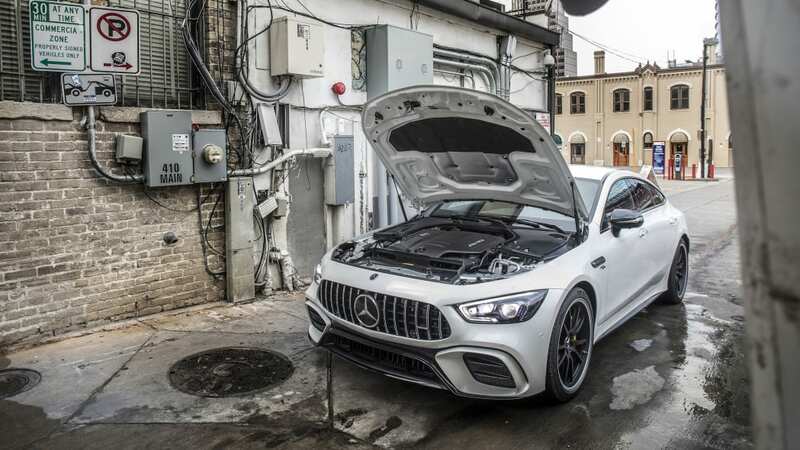 The biggest issues in terms of performance come down to tuning. 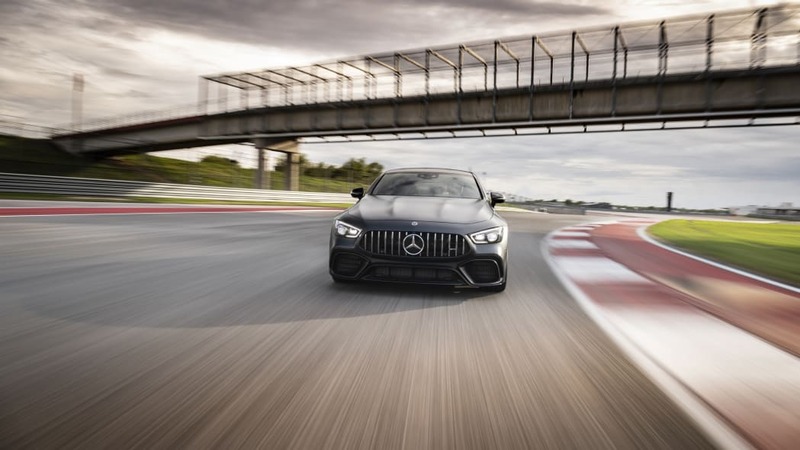 If left to its own devices, the transmission wants to upshift early. 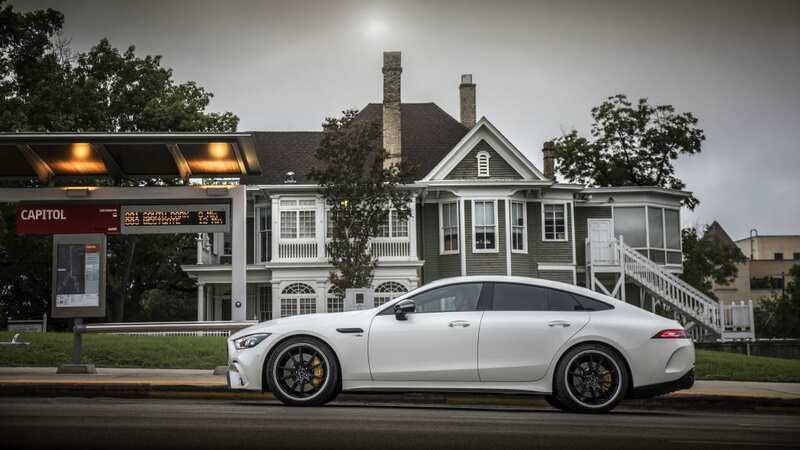 That's fine on the street, but you really need to use the paddles if you're pushing it on the track. 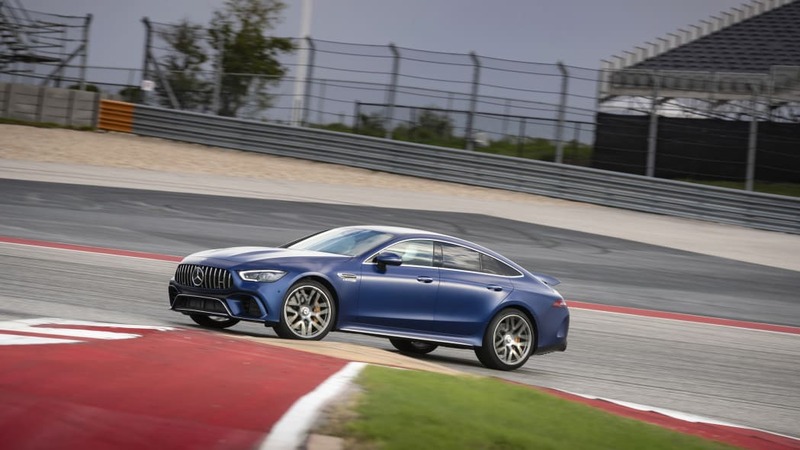 The second issue is just the amount of adjustment you need to make the car perform at its peak. 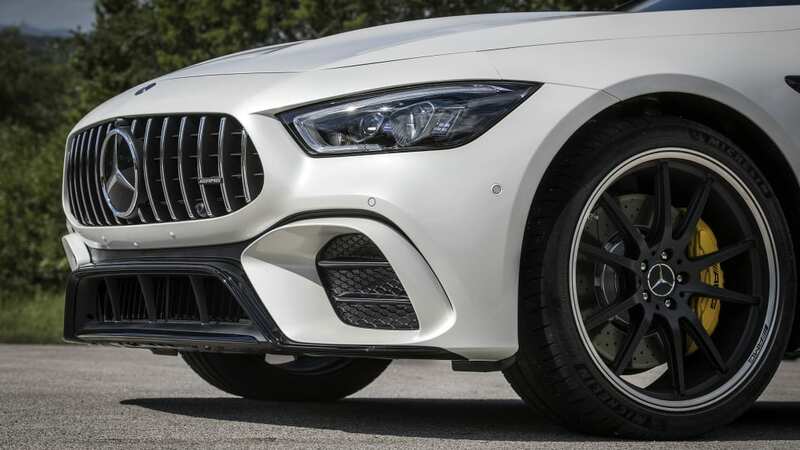 It has to be in race mode with the stability control and suspension set just so. 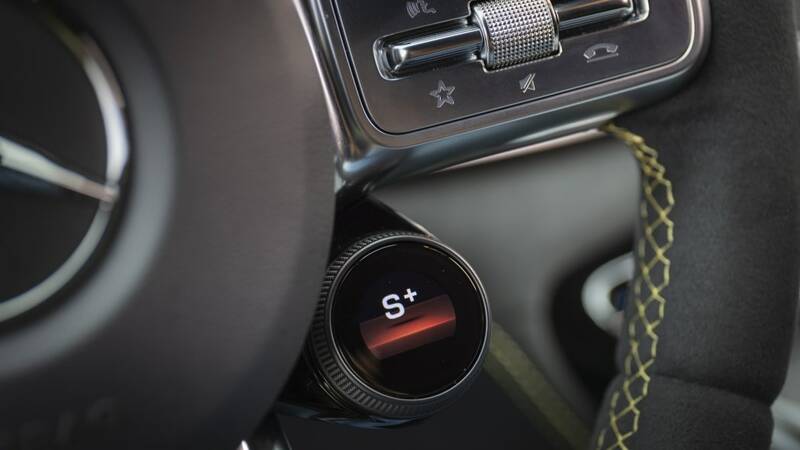 On key-up settings, everything's too conservative. 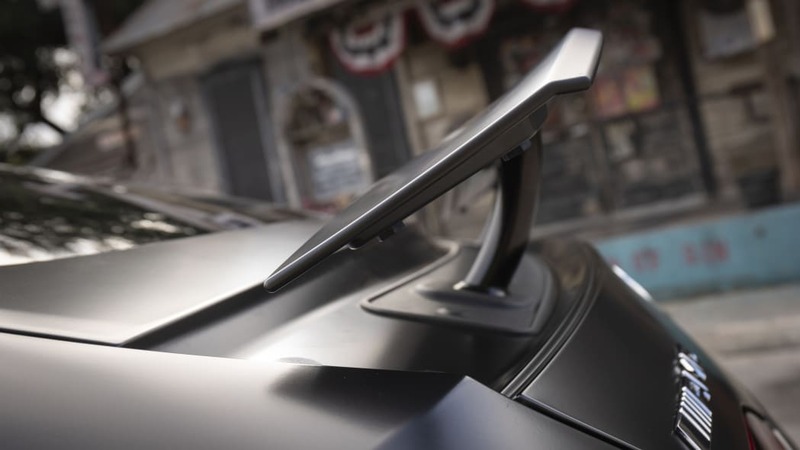 If you don't have it adjusted correctly, it can feel a bit flat. 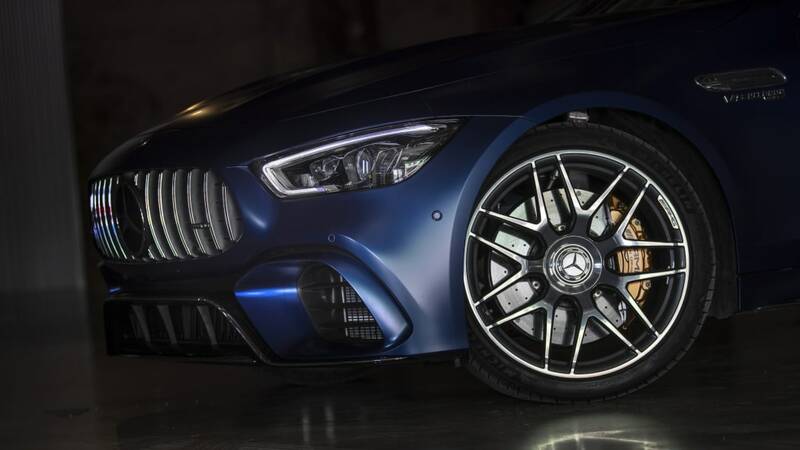 The styling on the other hand is a bit too round. 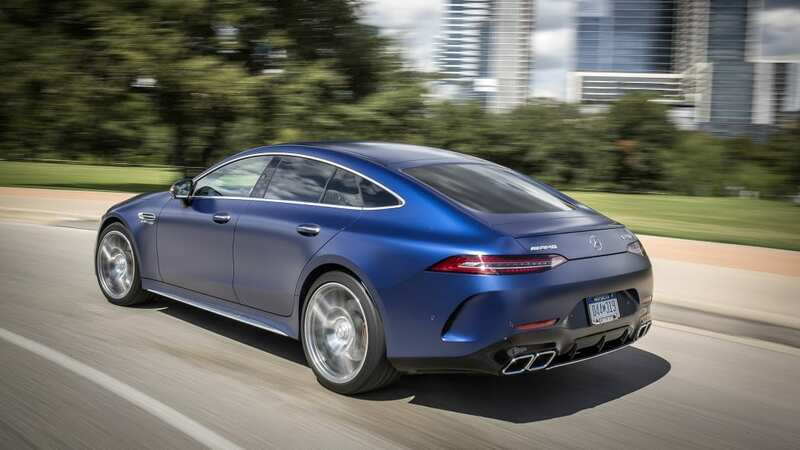 Frankly, the car looks fat, with wide hips and a bulbous nose. 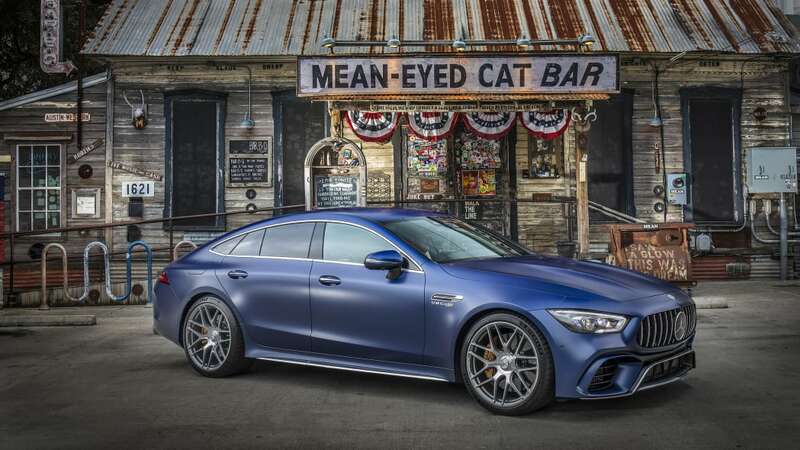 The Panamericana grille is making its way across the entire AMG lineup, and it just doesn't work here. 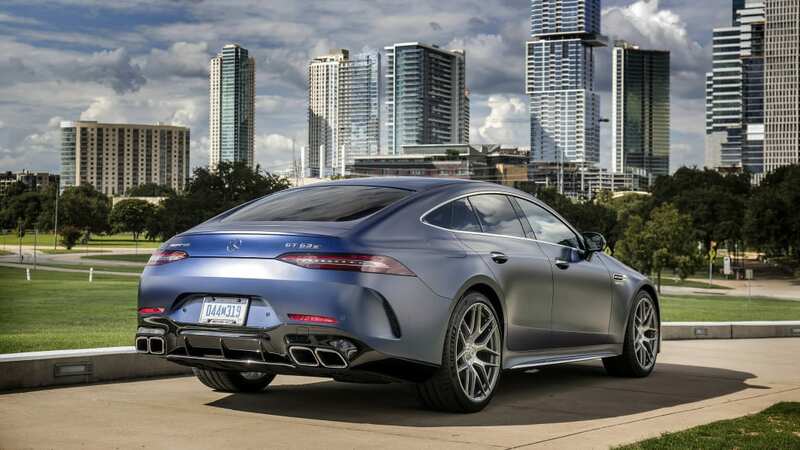 The similarly styled third-gen Mercedes CLS-Class takes the same basic shape and tightens up the lines. 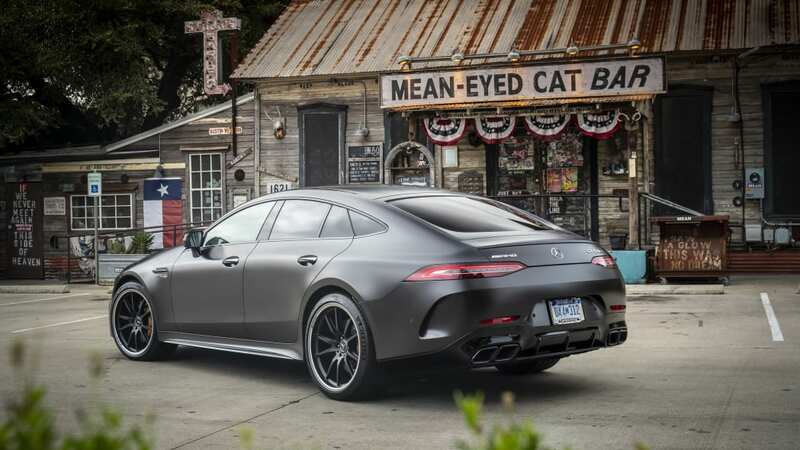 It's not perfect either, but it doesn't look as husky. 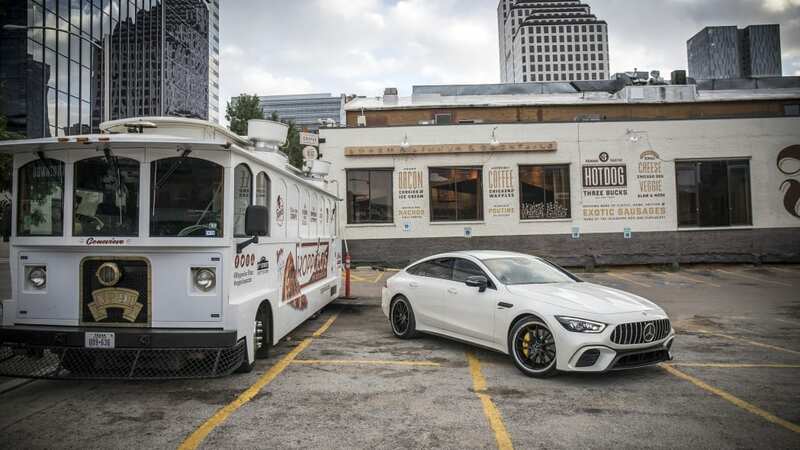 From a distance, the two cars look nearly alike. 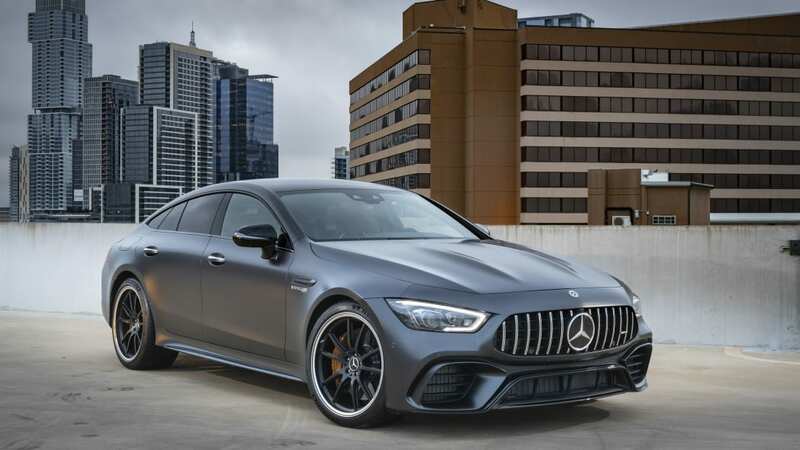 Only the grille and the GT's fastback roofline really separate the pair. 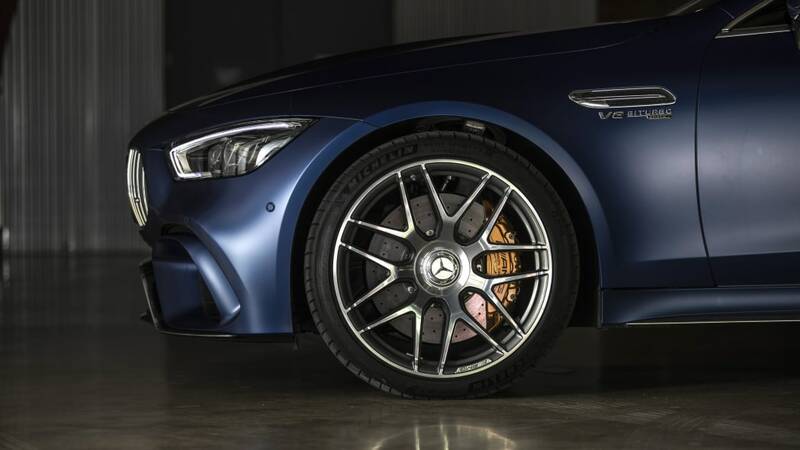 Mercedes is offering a number of exterior trim and wheel options. 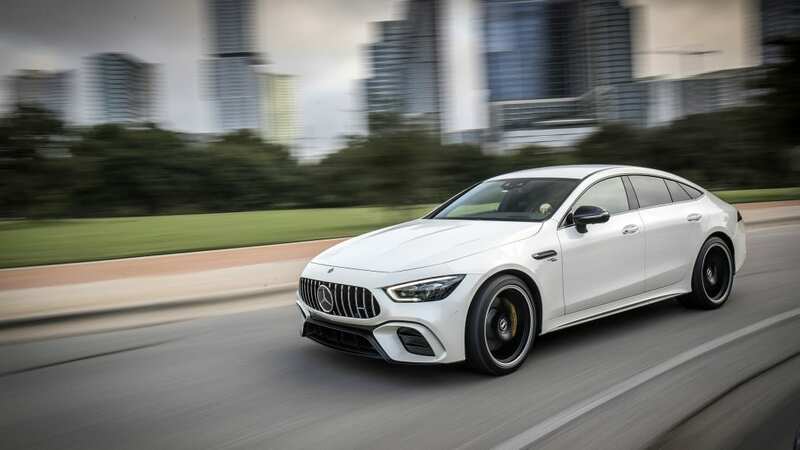 There's an aero package that adds a new front splitter and a fixed rear wing that looks like it was taken straight from the AMG GT R. Honestly, it's a bit garish. 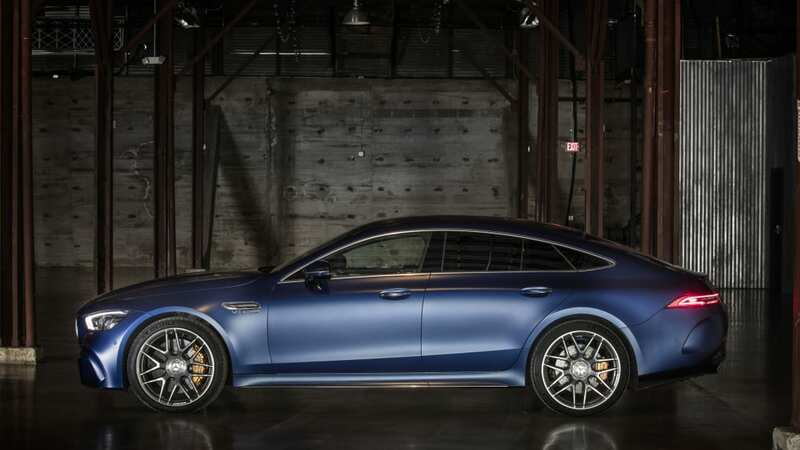 That said, the night package looks sleek sans chrome, and the modern monoblock wheels are delightful. 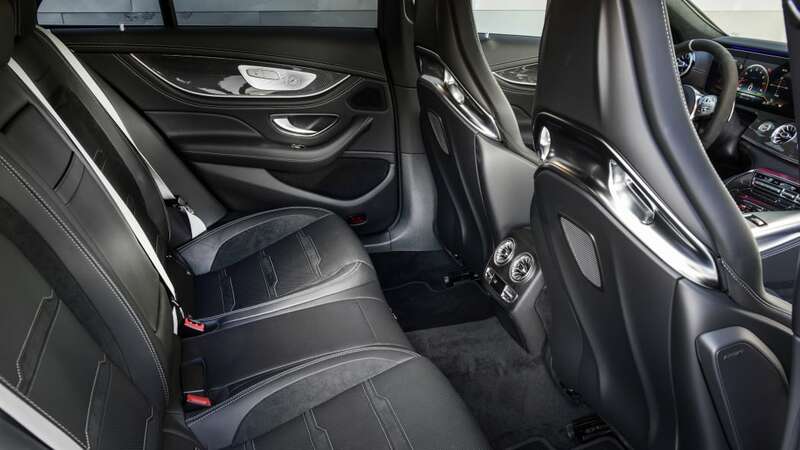 The interior is a totally different matter. 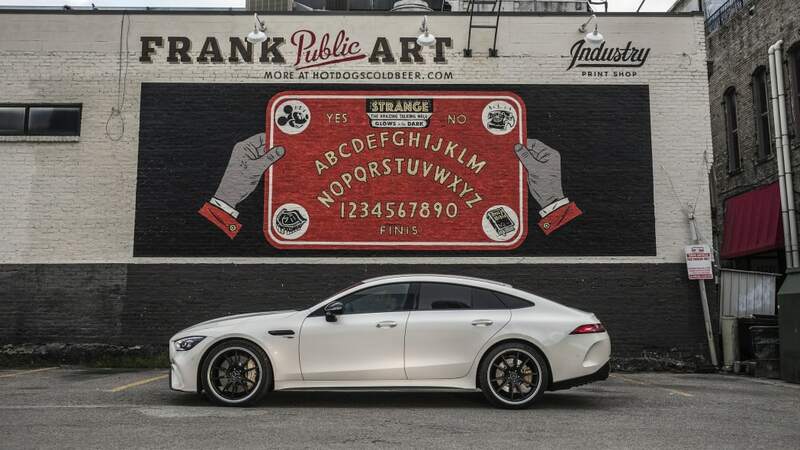 Frankly, it's stunning. 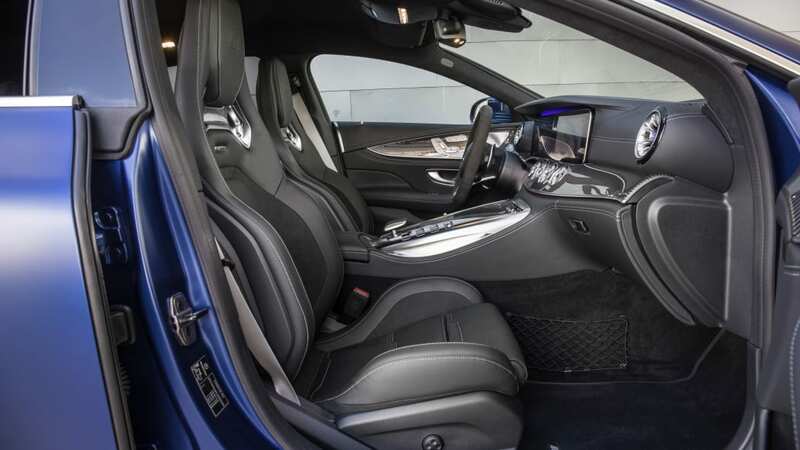 A wide, sweeping dash is accented with leather, wood, bright metalwork and soft accent lighting. 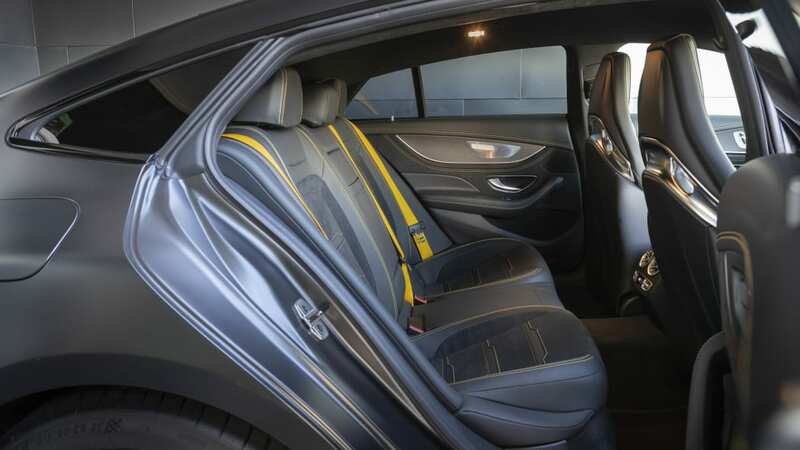 Mercedes offers carbon-fiber trim or yellow seat belts if you're into that sort of thing. 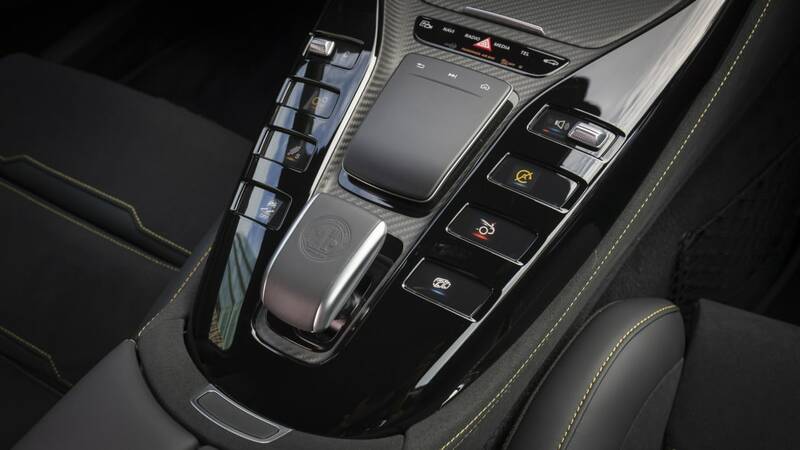 The buttons, knobs and air vents all feel as premium as they look. 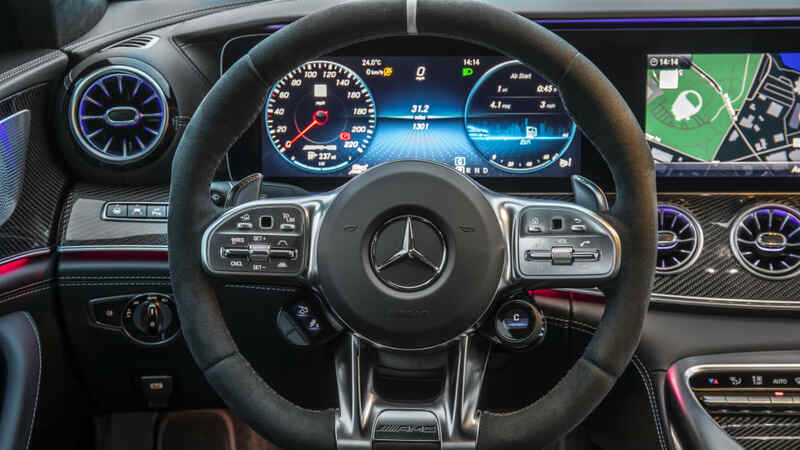 Faux suede, something Mercedes is calling Dinamica, wraps the rim of the flat-bottomed steering wheel. 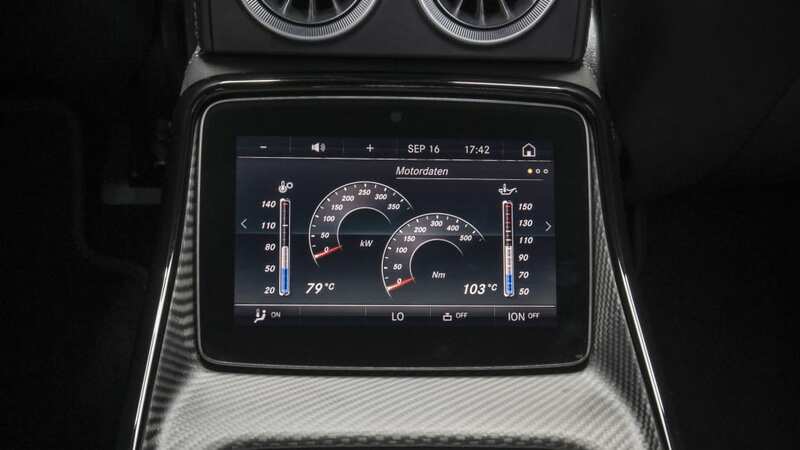 The wheel also features capacitive controls for the digital instrument cluster. 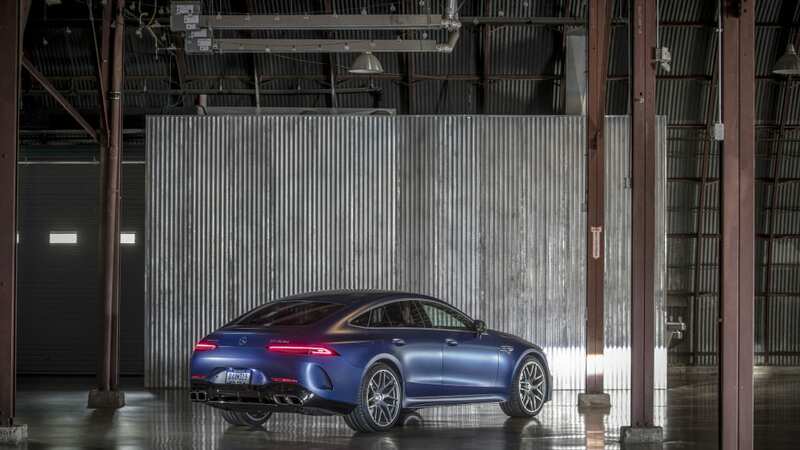 Once large piece of glass covers two separate and highly configurable screens. 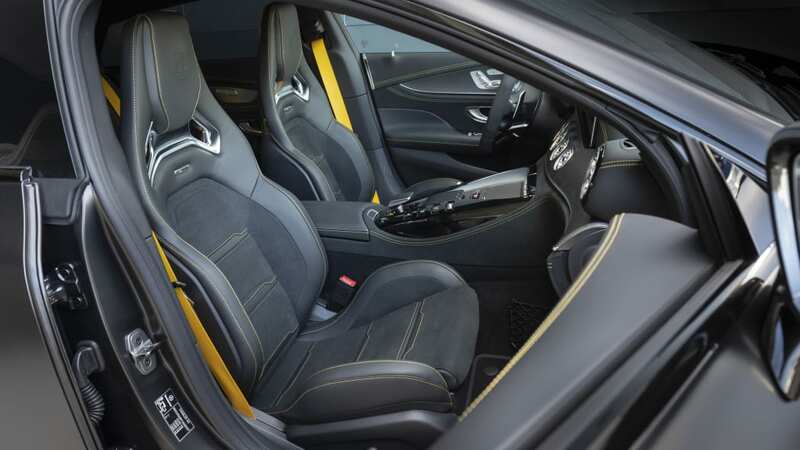 The nappa leather and Dinamica seats are thin but supportive, again striking a nice balance between sport and comfort. 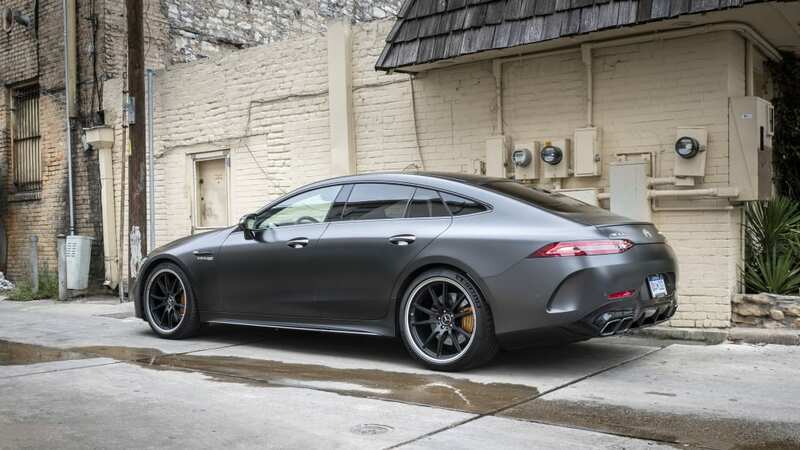 I would like a bit more lumbar adjustment, but it's a relatively minor thing. 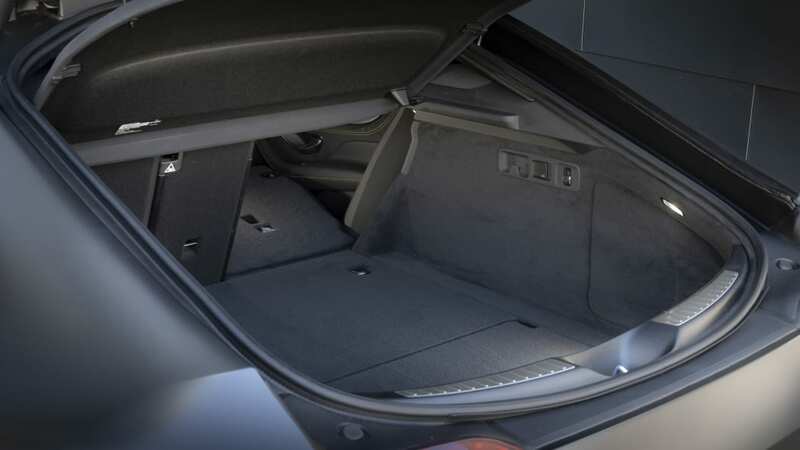 The roomy rear seat comes in two configurations, with or without the so-called executive package. 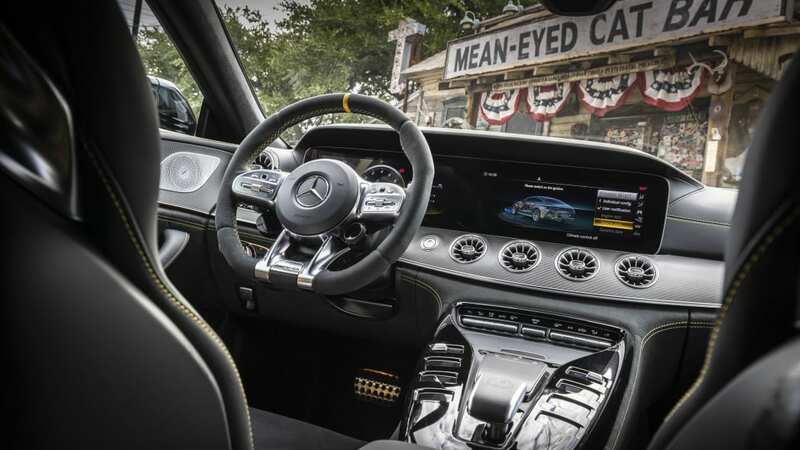 It includes a deep console and a digital display between the seats. 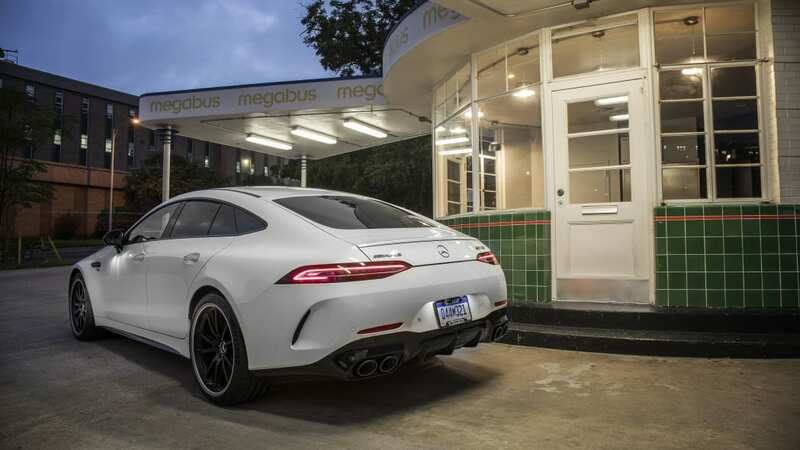 Outside of the U.S., customers can option a bench seat in the rear. The rear cargo area is great. 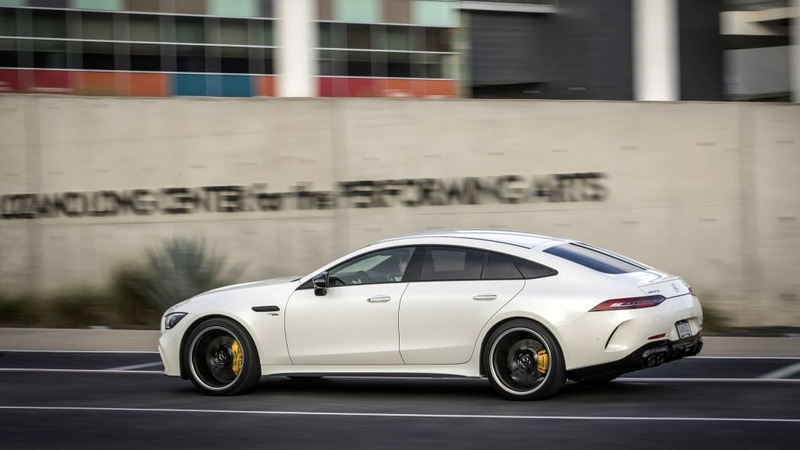 Like the Porsche Panamera, Audi A7 or Kia Stinger, the GT four-door is a hatchback. 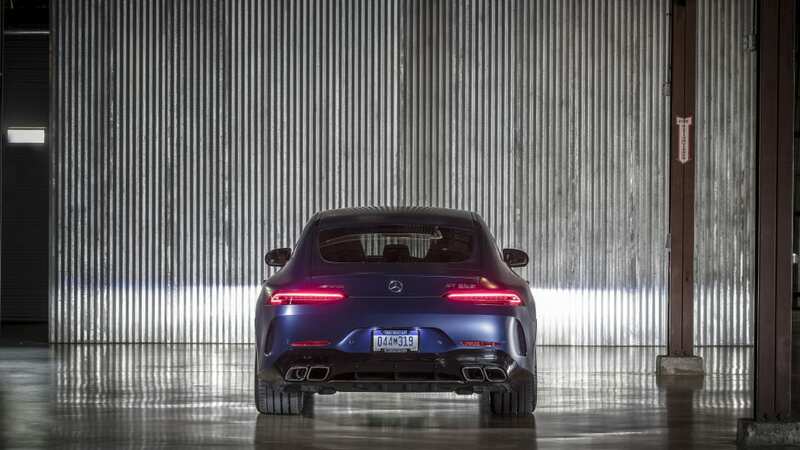 As with pricing and curb weight, cargo figures haven't been released, but suffice to say that the load area is sizable and easily accessed. 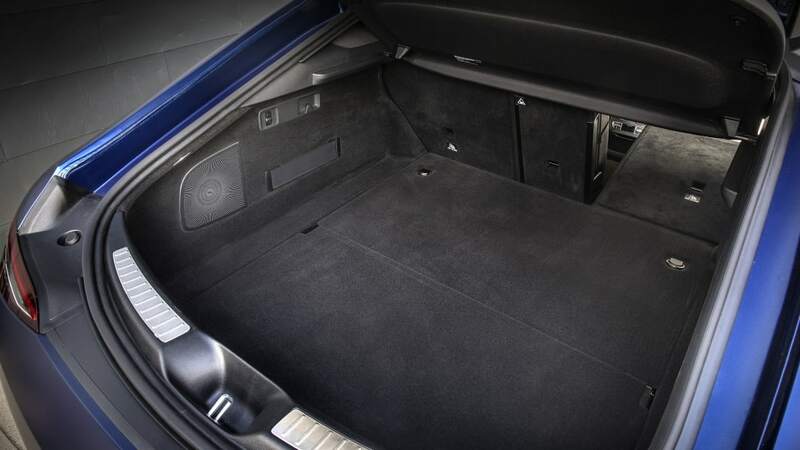 It's not a wagon, but it's better than a trunk. 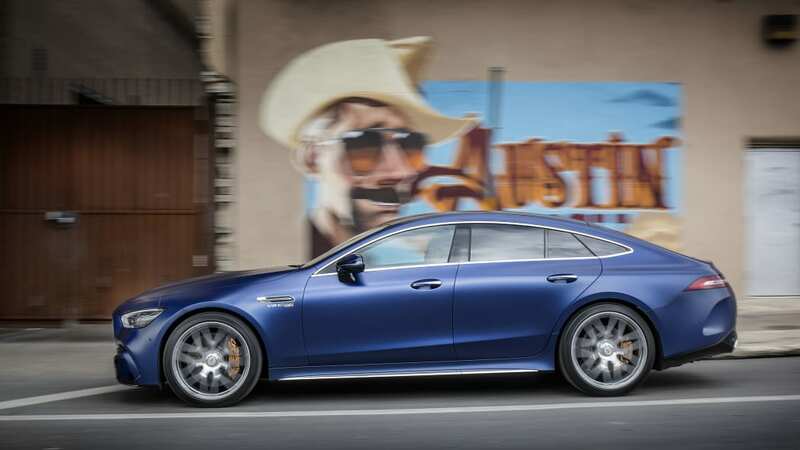 The GT four-door occupies a nebulous place in the Mercedes-Benz lineup. 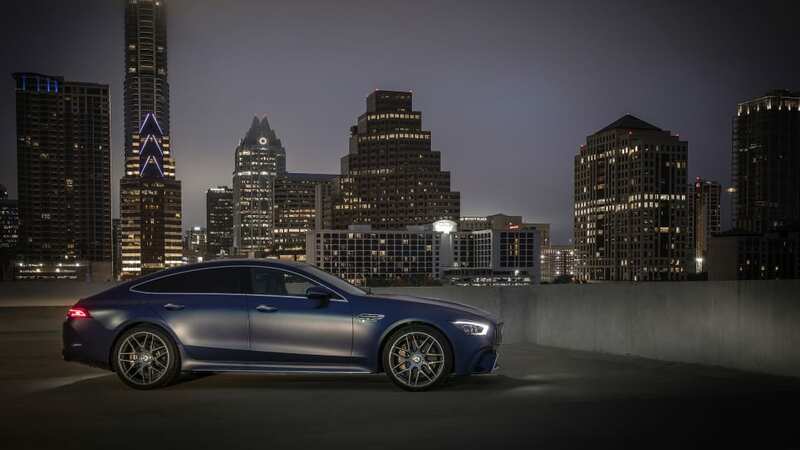 On its own, it's a fantastic performance sedan. 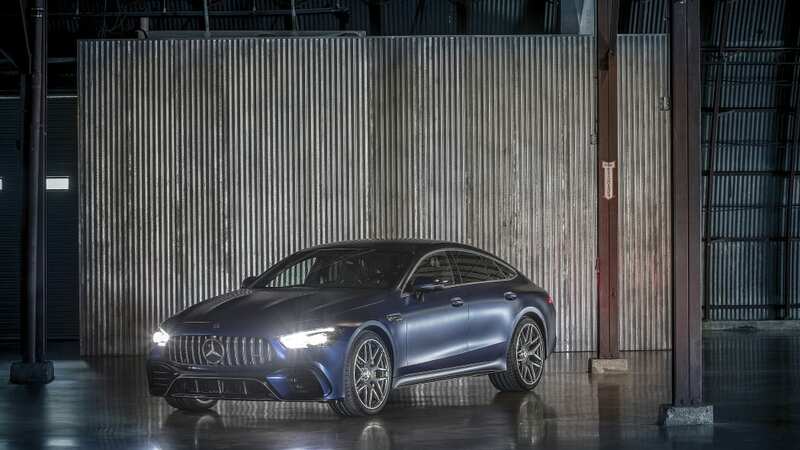 In reality, the GT four-door shares a showroom with the CLS and E-Class. 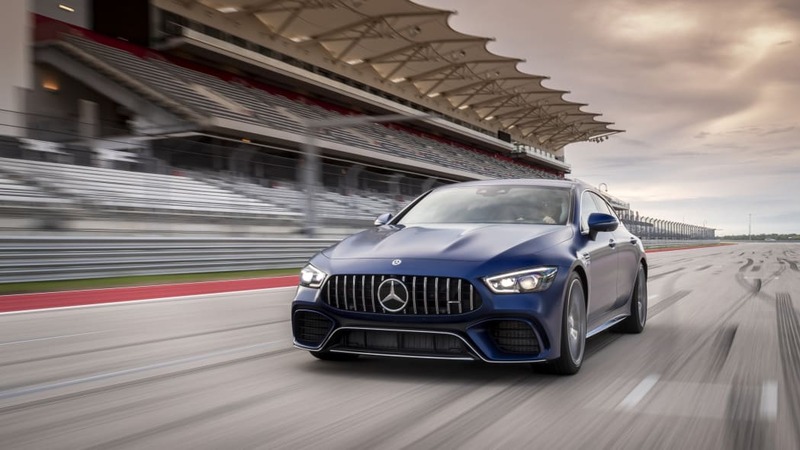 All three cars are generally the same size, and all three offer the new inline-six, though only the E and GT get the 4.0-liter V8. 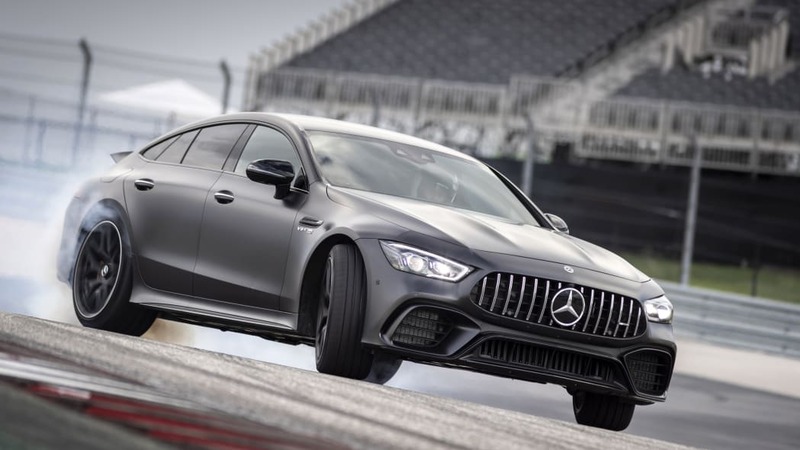 If you're not going to a track (or want to look like you might), the CLS or E might be a better choice. 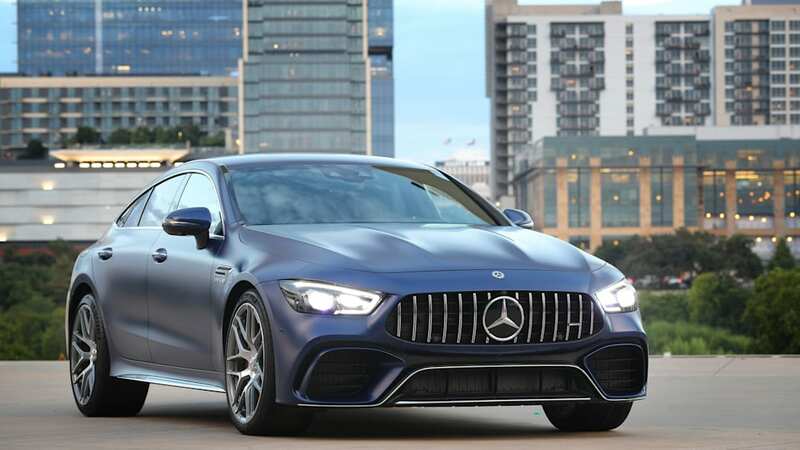 There's even an E 53 wagon on the way. 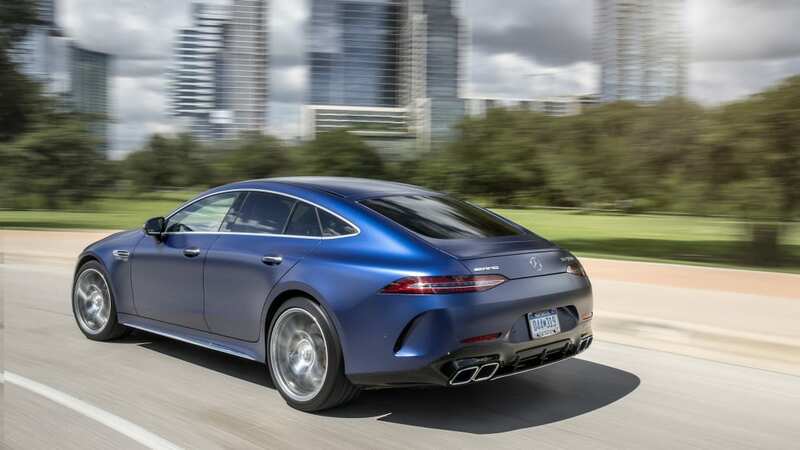 Currently, the closest competitor is the Porsche Panamera. 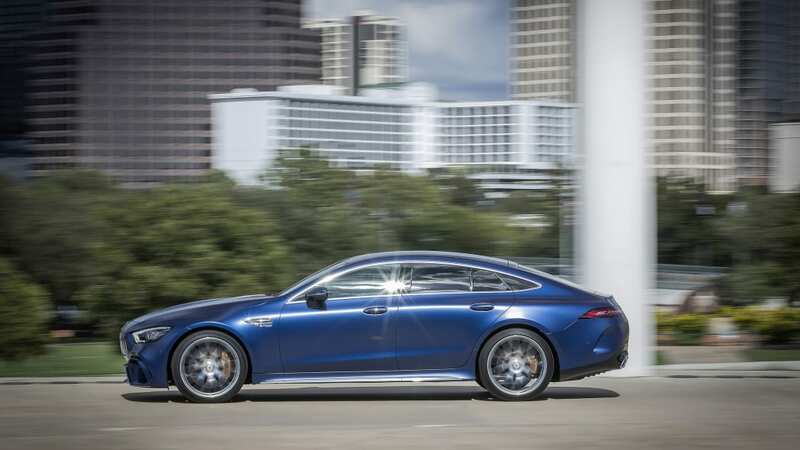 Like the AMG, the Panamera is a grand tourer masquerading as a roomy fastback. 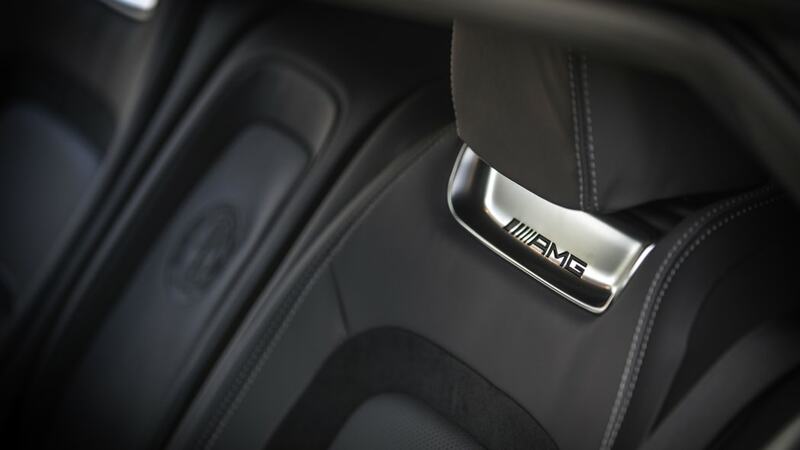 Neither are particularly good looking on the outside, but the AMG's interior puts the Porsche's to shame. 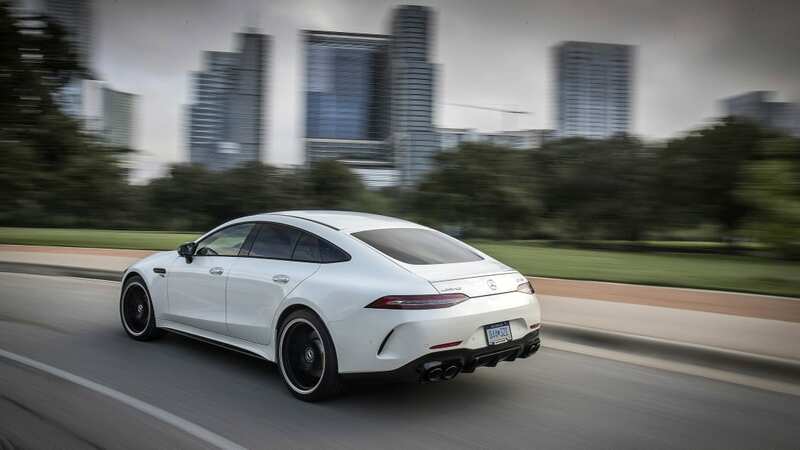 I prefer the AMG powertrains, too, though the Panamera does offer a compelling plug-in hybrid variant. 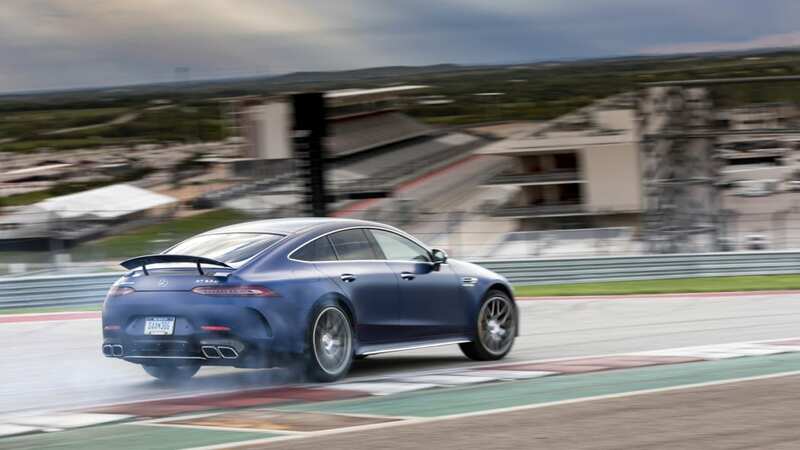 If tackling a track is your priority, the Porsche is better. 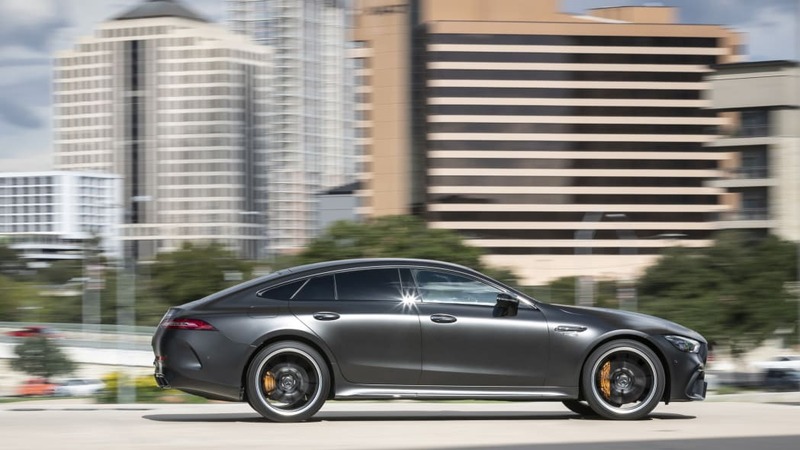 The AMG just can't match the Panamera's sharp, responsive steering and planted chassis. 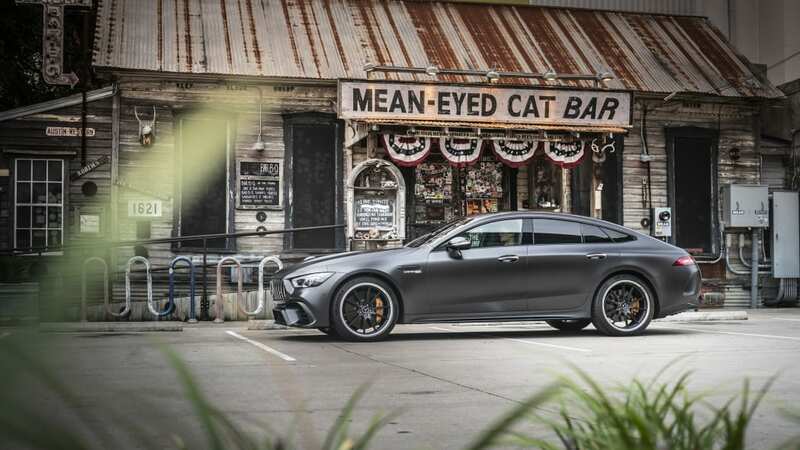 Everywhere else (and how often do you plan on tracking a car like this?) 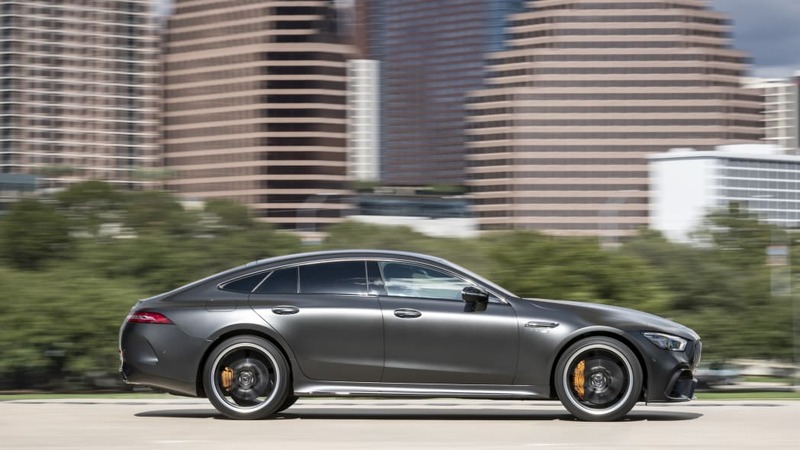 the GT four-door wins out.